The west branch of Stony Creek runs through a steep ravine visible. You can see the creek from the trail that runs along a ridge high above the creek. If you’d like a short, quiet walk all alone (I do occasionally), consider wandering for an hour or so in Stony Creek Ravine Nature Park. This 60 acre park is a bit farther off the beaten path than our other township parks; I seldom see another hiker when I’m there. For now, it’s only accessible from a single parking space at the end of Knob Creek Trail which is off of East Buell Road. It’s an in-and-out trail (no loop) that begins in sloping, glacial meadows. 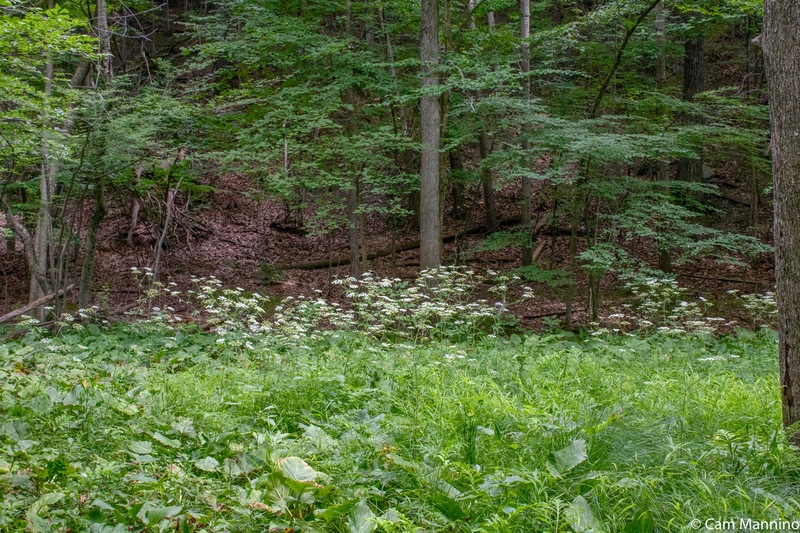 Follow the trail into an oak forest overlooking a deep ravine in which Stony Creek burbles and flows around fallen trees and rocks far below. 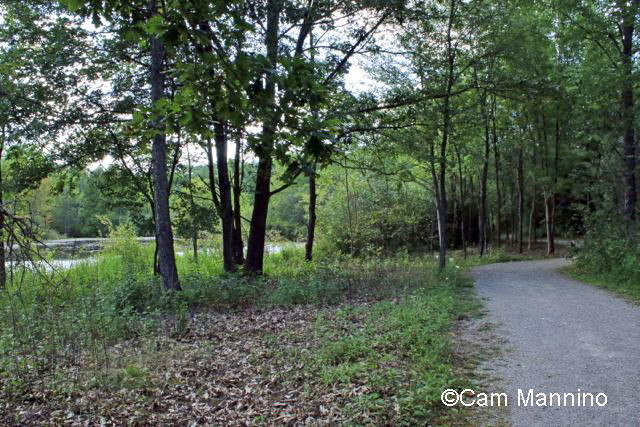 The Parks Commission has been awarded a matching grant from the Michigan Natural Resources Trust Fund to join this little park to 208 spectacular acres along Snell Road. But for now, it’s a quiet little getaway. Exiting a small woods at the start, the trail winds up through sunny meadows to the dark oak forest. Sunny Meadows: Illusive Birds and a Big, Beautiful Butterfly! 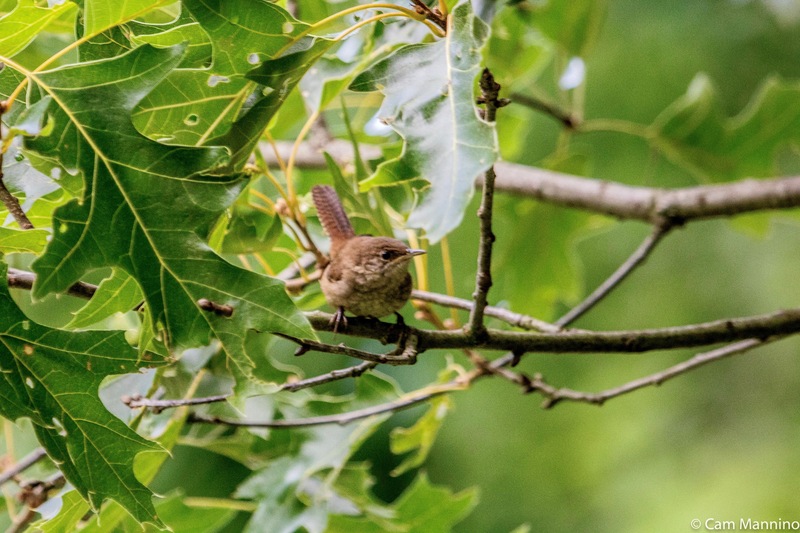 An adult wren scolds its young into hiding and scolds me as well! A fledgling wren peruses its world. The wren fledgling considers how far it is to the ground. Far out in the meadow in a tall, bare tree against a gray sky, the Eastern Towhee (Pipilo erythrophthalmus) threw back his head and sang. He abbreviated his spring song from “Drink your Teeeeeea” to simply “Your Teeeeea.” Just a reminder to other towhees, I imagine, that he was on his territory. An Eastern Towhee belts out his song high in a bare tree above the meadow. Wherever Bee-balm (Monarda fistulosa) and Butterfly Milkweed (Asclepias tuberosa) grace a meadow, it seems the butterflies gather to sip their nectar. Bee-balm is a favorite with lots of butterflies. 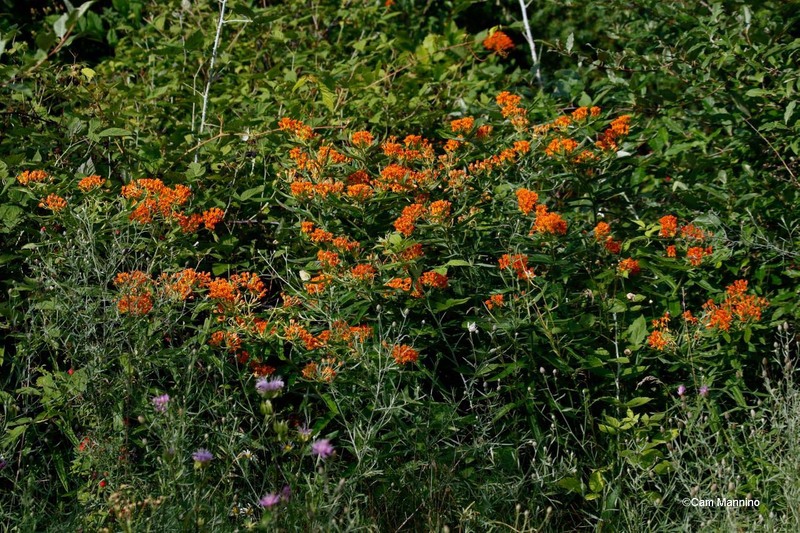 Butterfly Milkweed draws in its namesake time and again. In the same meadow in which it appeared last year, the Giant Swallowtail butterfly (Papilio cresphontes) floated above the flowers. The largest butterfly species in Canada or the United States (4-6 inch wingspread! ), the Giant Swallowtail can beat its wings once and sail on gracefully for a long distance. However, it flutters constantly as it feeds, rather than landing to sip at blossoms. These swallowtails migrate like Monarch butterflies do – going south each winter. The females are larger than the males, so the one below must be a female. Perhaps her wings against the Queen Anne’s Lace give you a sense of how large – and how striking – she is! Male and female Monarch Butterflies (Danaus plexippus) are choosing both mates and tasty flowers as they dip and rise among the Bee-balm at Stony Creek. The male has a slight bulge in one vein of each hindwing. The female doesn’t. A Monarch wraps its forked feet on the petals of a fading bee-balm blossom, preparatory to feeding. A female Monarch lands on a fading Ox-eye Daisy. 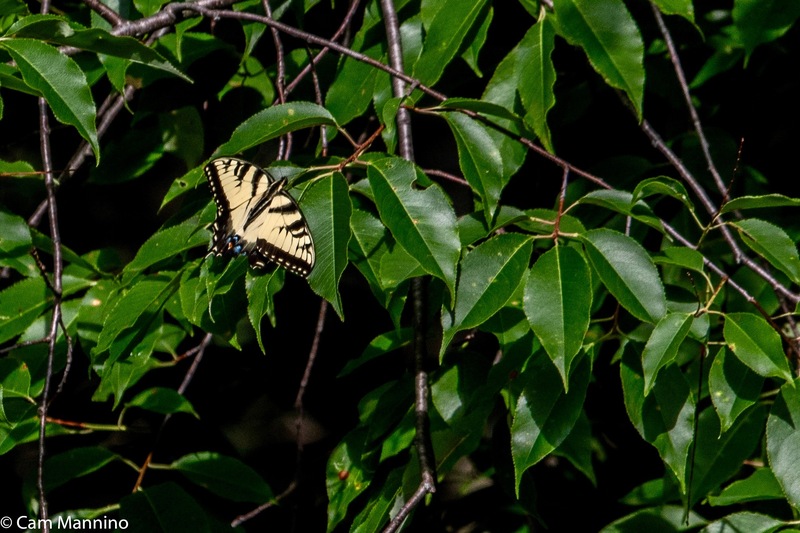 A female Eastern Tiger Swallowtail (Papilio glaucus) soared high overhead, landing in a Wild Black Cherry tree (Prunus serotina), a host plant on which her caterpillars can feed. She may have landed to lay her eggs on a leaf or she could be displaying her beauty and availability against the green leaves for any interested mate. Tiger Swallowtails in our area mate once or twice each summer and their pupae overwinter in their chrysalises until next spring. A female Tiger Swallowtail lands on a Wild Black Cherry tree that could act as a host plant for her caterpillars. 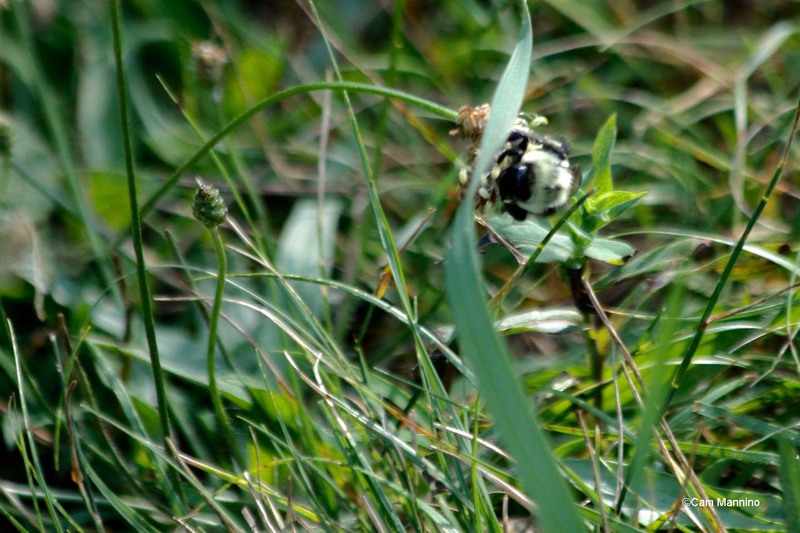 Far below, deep in the grass, a Cabbage Butterfly (Pieris rapae) landed on a grass stem. For the first time, I noticed the delicate architecture of the underside of its wings – and its long elegant antennae. Males have only a single spot on the fore and hind wing, so I think this is a male. 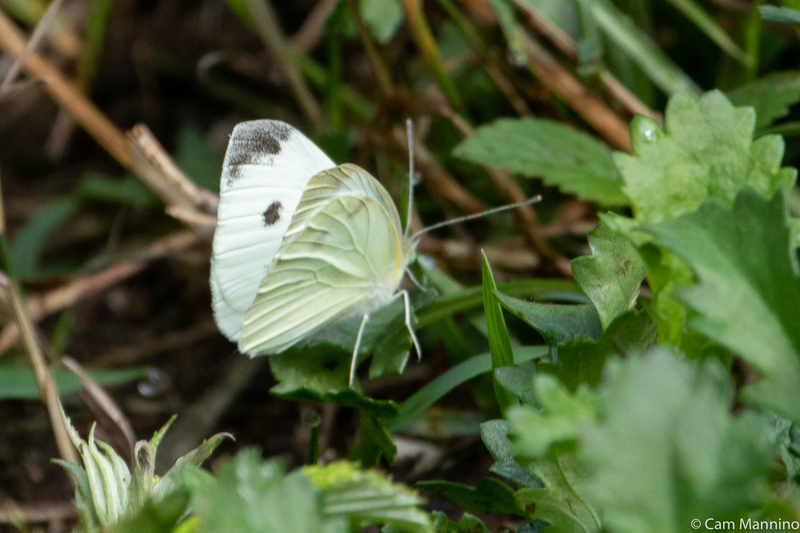 A Cabbage butterfly displays the intricate architecture on the ventral (lower) side of its forewing. A curious predator, a female Common Whitetail Dragonfly (Plathemis lydia), watched me from a grass stem with great interest. Humans, after all, are so good at stirring up prey – easy pickings! Love that face! A female Common Whitetail dragonfly looks eagerly for prey stirred up by my passage. I first came across some fungi fatale – Amanita mushrooms (family Amanitaceae). Though squirrels nibble on them, they are highly toxic to humans. They are sometimes (not always!) recognizable by little warts on their surface and a collar that forms on the stem. Here are two just beginning to emerge from the soil on the path and a lovely mature white one, slipping out of a crack in the earth. 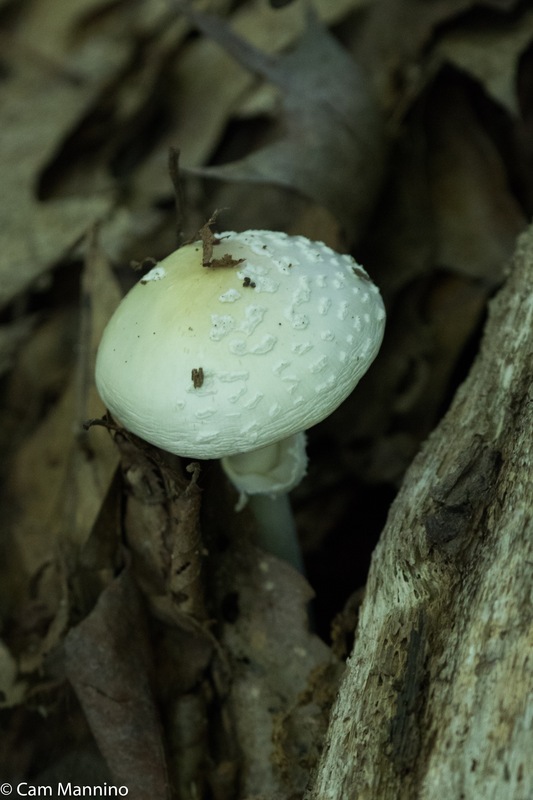 A toxic Amanita mushroom emerging from the trail. Another emerging Amanita a little further along. Small red mushrooms appeared along the woodland trail as well. Joshua Aaron on the “Mushroom Identification” Facebook page identified these as members of a large worldwide genus of red mushrooms called Russula. Some are toxic, some not, so again caution is required. Clearly some creatures gave these a nibble and decided to leave the rest. A Russula mushroom that looks a bit like a chomping Pac-man! A Russula mushroom nibbled, probably by a squirrel. 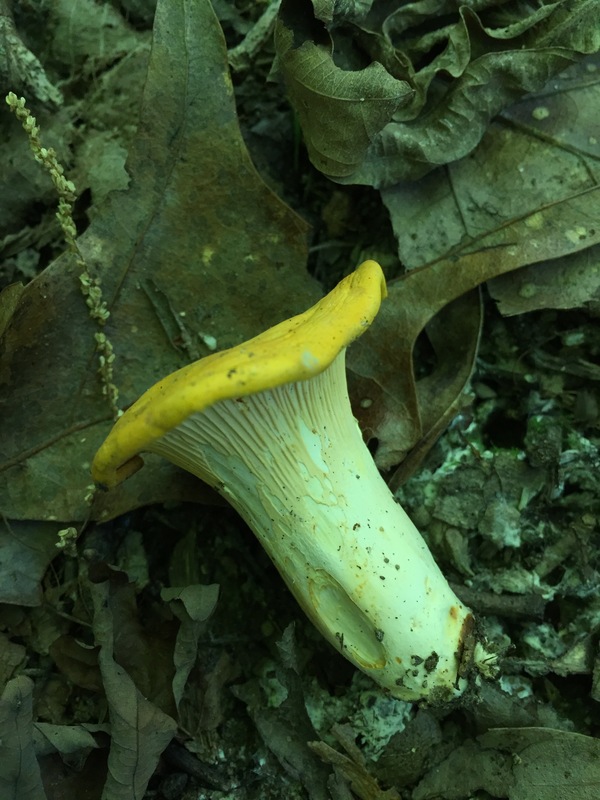 Both Amanita and Russula mushrooms are fruiting bodies of those fabulous mycorrhizal fungi which help the trees reach and process nutrients from the soil while the tree feeds them its sugars created by photosynthesis. 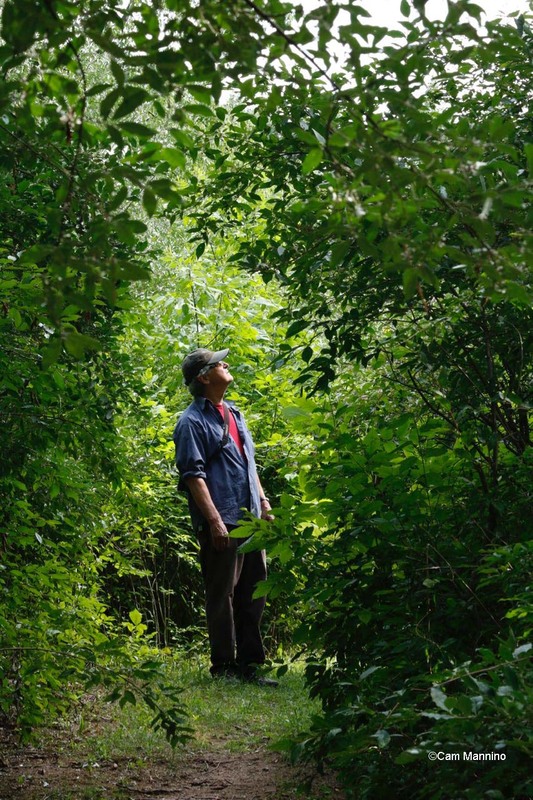 Helping a healthy forest along is another good reason to let them stay where they are and reproduce! 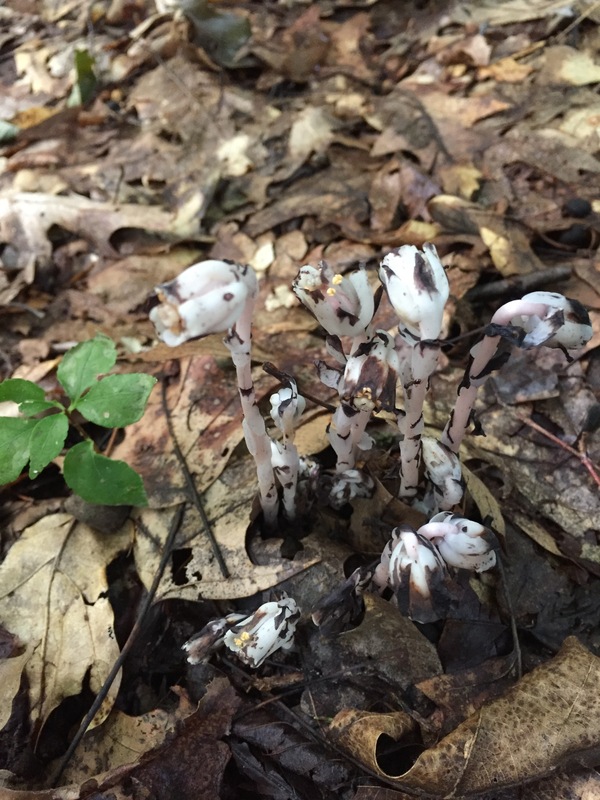 It turns out that a nearby plant, Indian Pipe (Monotropa uniflora), which appears to be a mushroom, isn’t one. It’s more unusual – a parasitic plant. Indian Pipes have no chlorophyll to use in photosynthesis like green plants do. Instead they tap into fungi, like Russula mushrooms, beneath the soil, feeding on the same sugars that the trees share with the fungi. It’s not too different from the way we tap maples for their sweet sap, is it? Indian Pipe is a parasitic plant that feeds off fungi beneath the soil. Nearby grew what folks at the Facebook page identified as Chanterelle mushrooms (genus Chantarellus), which, assuming that’s correct, would make them edible. I left them to disperse their spores undisturbed in the interests of both safety and respecting the natural state of our parks. One had fallen over so I got a good look at its fake gills, which are one of the signs of Chanterelles. A Chanterelle mushroom with its fake gills on the stalk. 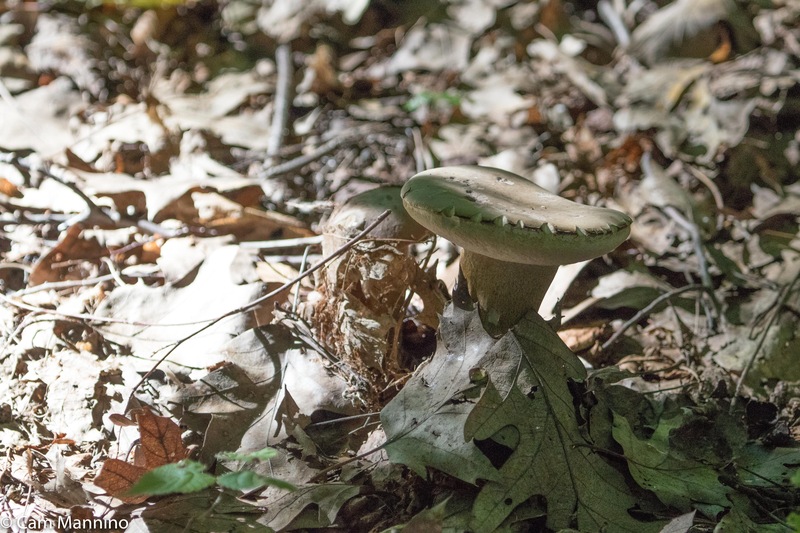 A couple of Bolete mushrooms had emerged among the oak leaves along the trail. These mushrooms (family Boletaceae) have pores below their caps instead of gills. They also belong to a big mushroom group that includes both inedible and edible ones. Porcini mushrooms, for example, are boletes. A bolete mushroom with pores beneath its cap rather than gills. Although its song accompanied me for over an hour, the bird never emerged from the leafy treetops. 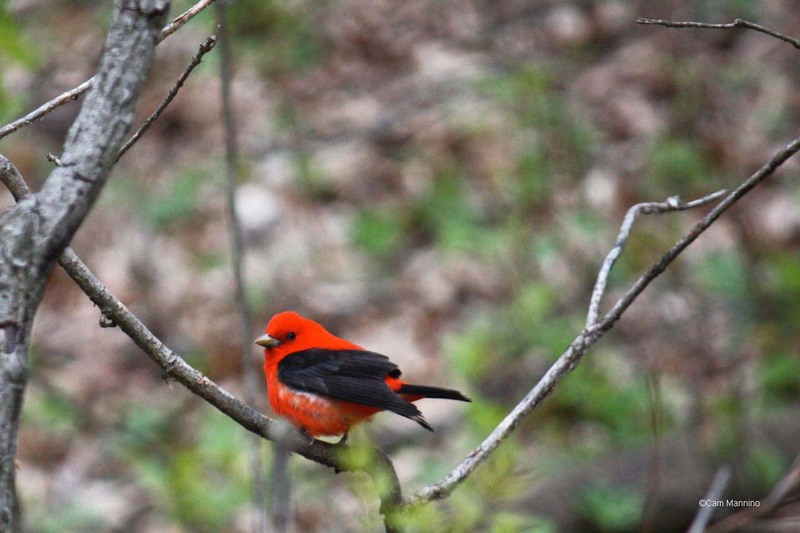 So here’s what I missed – a photo of a Scarlet Tanager that I took at Bear Creek. The Scarlet Tanager that I evidently heard but didn’t see. This is a photo from Bear Creek in previous years. 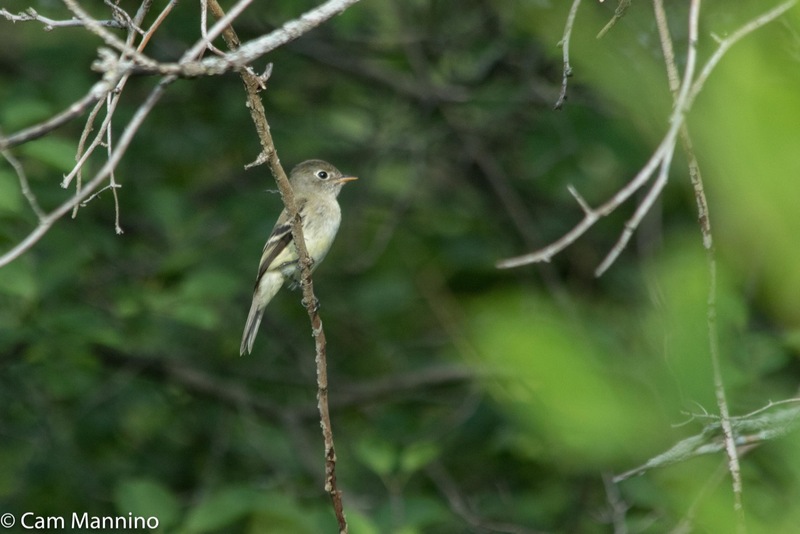 A plaintive song haunted the shady forest one morning – the questioning call of the Eastern Wood-Pewee. 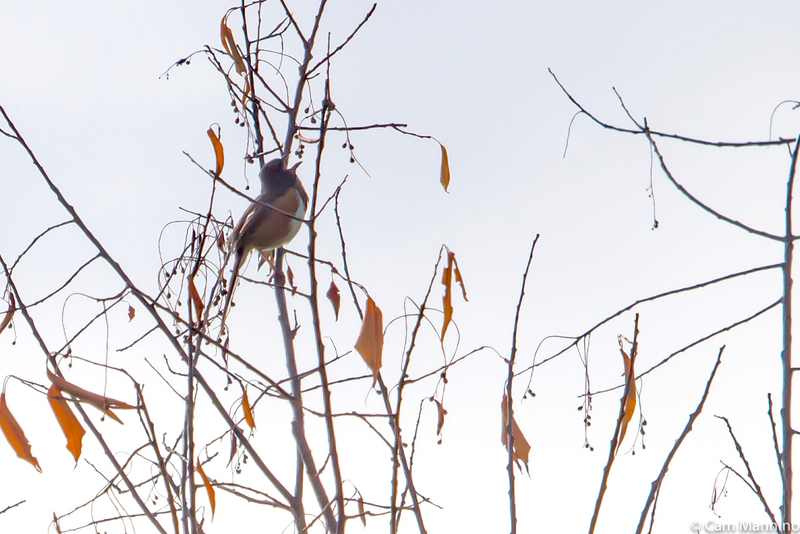 I could see this small bird in the high branches of a distant tree, but as soon as I moved closer, it moved farther off. So here’s a photo I took of one at Bear Creek Nature Park a couple years ago. 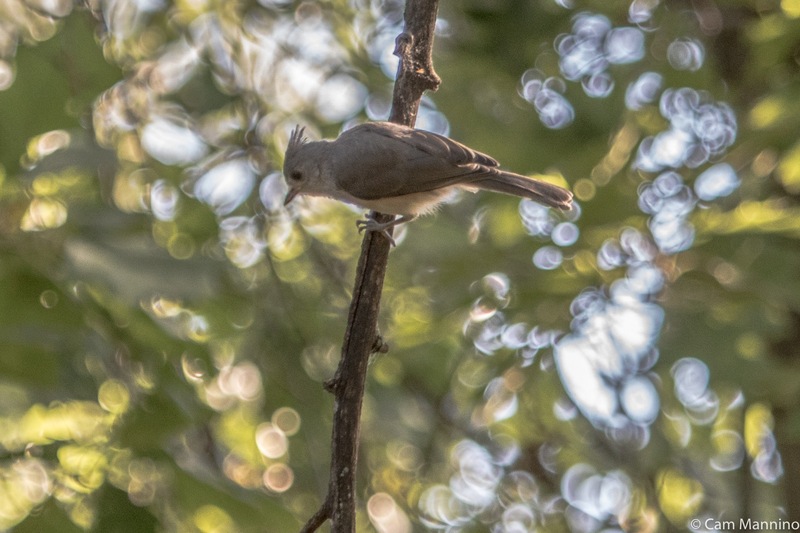 What seemed to be a juvenile Tufted Titmouse (Baeolophus bicolor) hung from a vertically suspended branch in the forest. Its forehead patch (between the eyes) was gray rather than black (hard to see in the photo) and its buff sides were less pronounced – field marks of a fledgling according to Stokes’ Guide to Bird Behavior (Vol.2). With its crest a bit ruffled, it looked as though it was not quite sure what to do next. A young Tufted Titmouse considers its next move at the edge of the woods. 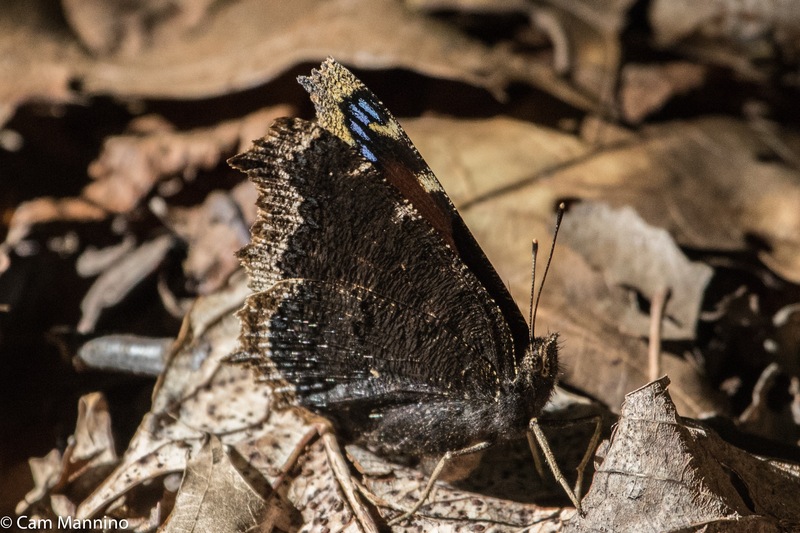 On one warm morning, I noticed two Mourning Cloak Butterflies (Nymphalis antiopa) dancing through the green dimness of the woods. Last fall, Morning Cloaks went into hibernation within hollow logs or under loose bark. There they freeze nearly solid during the winter, their cells protected by self-produced anti-freeze. Very early in the spring, often before the snow melts, they emerge, looking pretty ragged. They mate and reproduce so that by mid-summer, their young emerge. I’m guessing that’s why the ones I saw at Stony Creek Ravine appeared to have just wriggled out of their chrysalises. They were near perfect specimens. One landed, wings open, on a fallen log. A fresh-from-the-chrysalis Mourning Cloak butterfly on a fallen log. The other folded its wings, showing the underside which closely resembles the tree bark under which they hide in the winter, camouflaging them with protective coloration. Quite a difference from the dorsal (upper) side of those wings, eh? 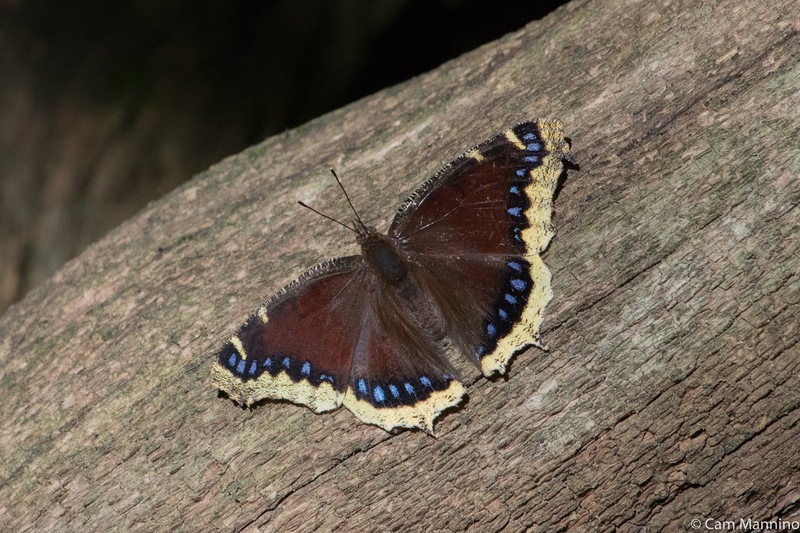 The underside of the wings of the Mourning Cloak provide great camouflage against tree bark. Native grasses and plants thrive in the light, drier shade along the edge of the forest. 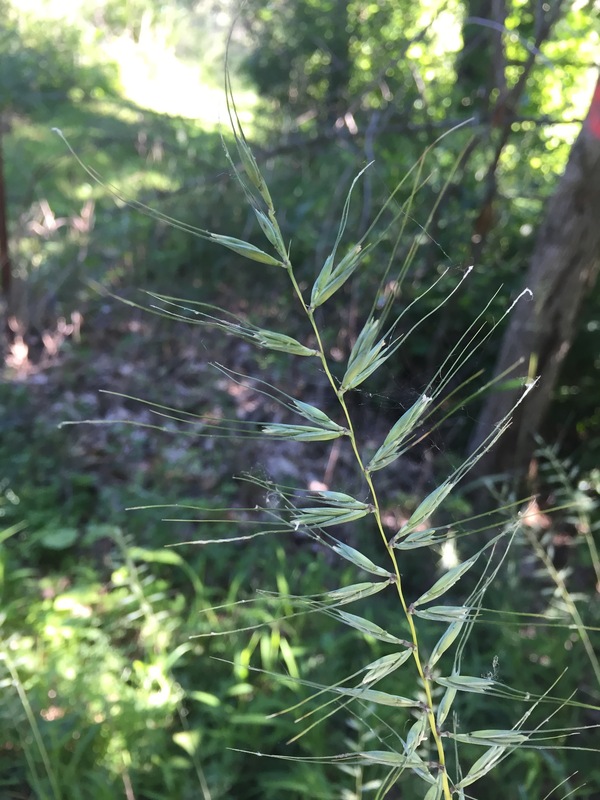 I’m particularly fond of the arrow-like spikelets of Bottlebrush Grass (Elymus hystrix). 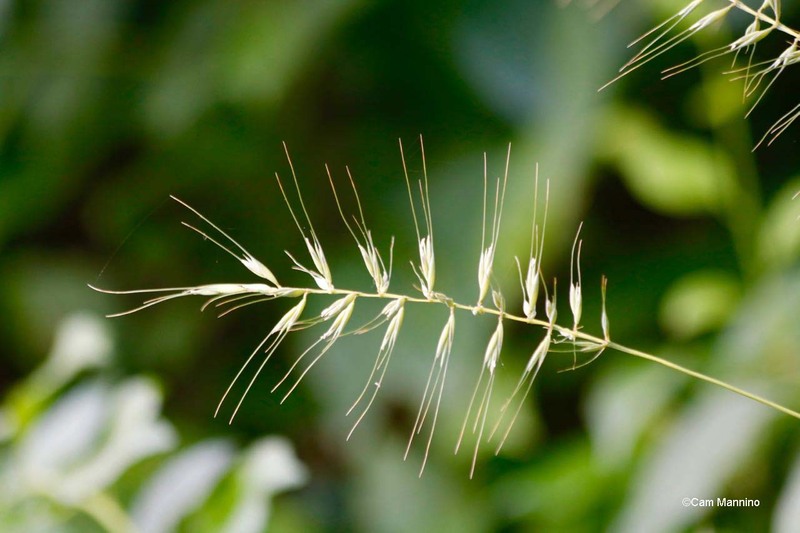 Carrying their seeds inside, the spikelets eventually shoot along on the wind and then pierce the ground, giving the seeds a chance to spread and then be neatly planted. Bottlebrush Grass has spikelets neatly arranged along its stem, giving the impression of a bottle brush. 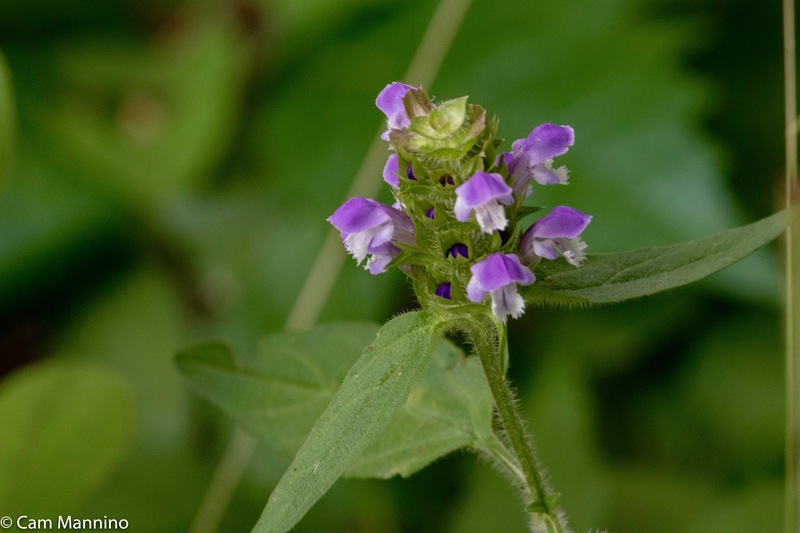 Native Heal-all (Prunella vulgaris) is everywhere in shady areas. Some still believe it has medicinal value. I like it for two reasons – the way its purple flowers protrude from its barrel-shaped calyx and the fact that when a raindrop hits the plant, the calyx flexes and flings out the seed. I hope to see that someday! Each little flower of Heal-all makes four tiny seeds that are flung away from the plant when hit by a raindrop. Where the forest ends and the wetlands begin at the bottom of the ravine, a flower fatale flourishes – Water Hemlock (g. Circuta). Every part of this plant is toxic to humans and other mammals (but as I’ve said before, who would eat it?) – so avoid the fate of Socrates and just admire its big, umbrella-shaped blossoms nodding in the breeze. 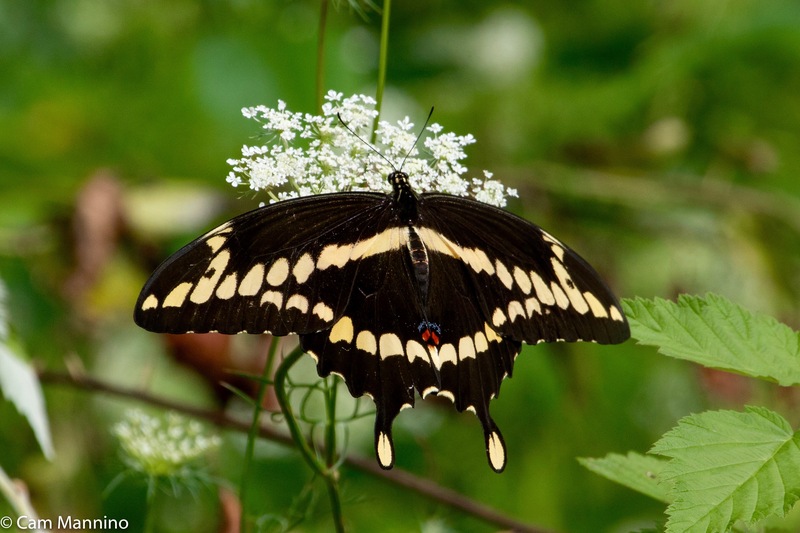 Many insects, however, feed on Water Hemlock, and it hosts the caterpillars of Black Swallowtail butterflies! 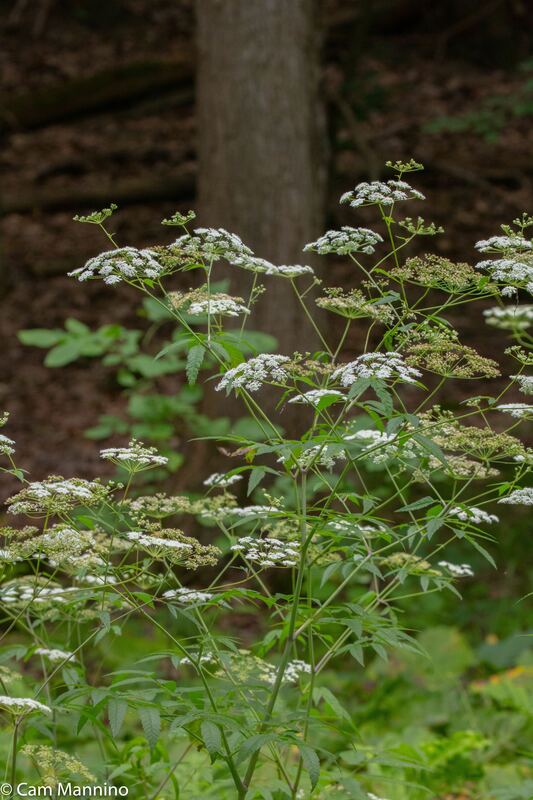 Water Hemlock grows in the ravine with big umbrella-shaped blossoms. While toxic to mammals, this plants helps us enjoy more Black Swallowtail butterflies! An iridescent cloud of male and female Ebony Jewelwing Damselflies (Calopteryx maculata) darted in and out of the shadows near the creek. These predators of many species are also the prey of many. So thank goodness these beautiful creatures lay lots of eggs! One of many male Ebony Jewelwing damselflies by the creek. 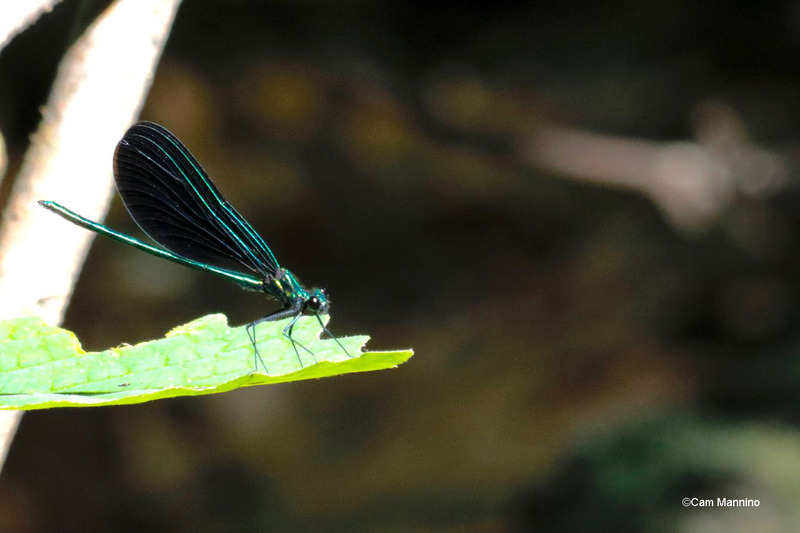 The female Ebony Jewelwing has an elegant black/bronze wing with a white spot. Nearby in patches of sunlight grew golden stands of a lovely wetland flower called Fringed Loosestrife (Lysimachia ciliata). This native wildflower modestly bows its blossoms toward the wet soil waiting for a Melittid bee to come along. These native bees specialize on this flower, feeding its oils and pollens to its larvae. Fringed Loosestrife can also spread by rhizomes beneath the soil. Fringed Loosestrife loves “wet feet” and partial shade. It blooms in sunnier patches near the edge of Stony Creek. 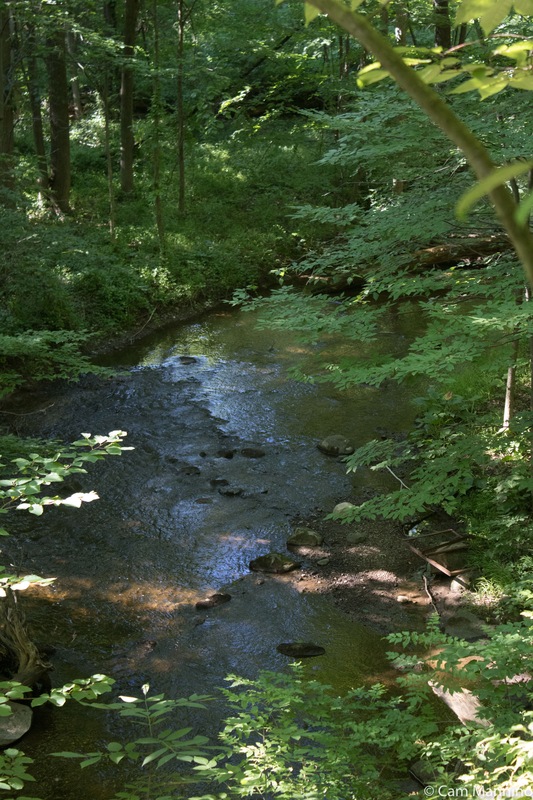 If you turn up your volume, perhaps you can hear the babble of Stony Creek as it finds it way over stones in the ravine. Such a soothing sound. But you don’t need to traverse the steep sides of the ravine and get wet feet. You can simply rest on the high ridge where the trail ends and watch the water sparkle as the creek rounds a graceful curve right below you. Combined with the birdsong in the treetops, the whispering of summer leaves, and the flutter of butterfly wings, you should walk back out of this little park feeling a bit more mellow than when you walked in. Footnote: My sources for information, besides Oakland Township's Stewardship Manager Ben VanderWeide, are as follows: inaturalist.org; Allaboutbirds.org, the website of the Cornell Ornithology Lab at Cornell University; Wikipedia; Herbarium of the University of Michigan at michiganflora.net; various Michigan Field Guides by Stan Tekiela; Butterflies of Michigan Field Guide by Jaret C. Daniels, A Guide to Bird Behavior Vols.1-3 by Donald W and Lillian Q.Stokes, and others as cited in the text. The diversity of Oakland Township’s parks and natural areas is a source of repeated surprise and delight for me. 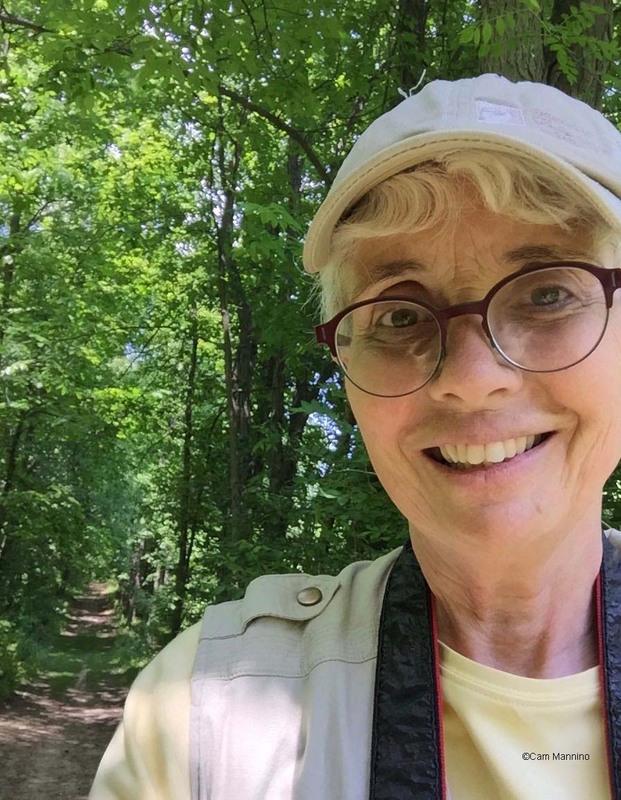 In the last few, very hot weeks, my husband Reg and I have explored the cool, shady trail that threads its way through Stony Creek Ravine Nature Park, a hidden gem that is still under development by the Parks and Recreation Commission. Be prepared to feel you are up north or even out west as you wind your way along a high ridge overlooking the creek. The 0.4 mile hike isn’t long but it is dramatic. You begin in a tunnel formed by tall shrubs. Here Reg stops to listen to birdsong as we enter the park. 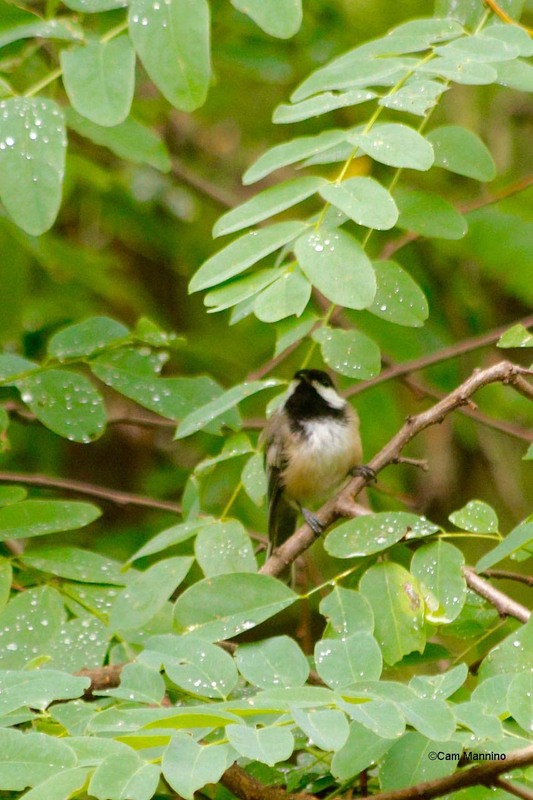 Birdsong can be heard all around you when you enter Stony Creek Ravine Nature Park. 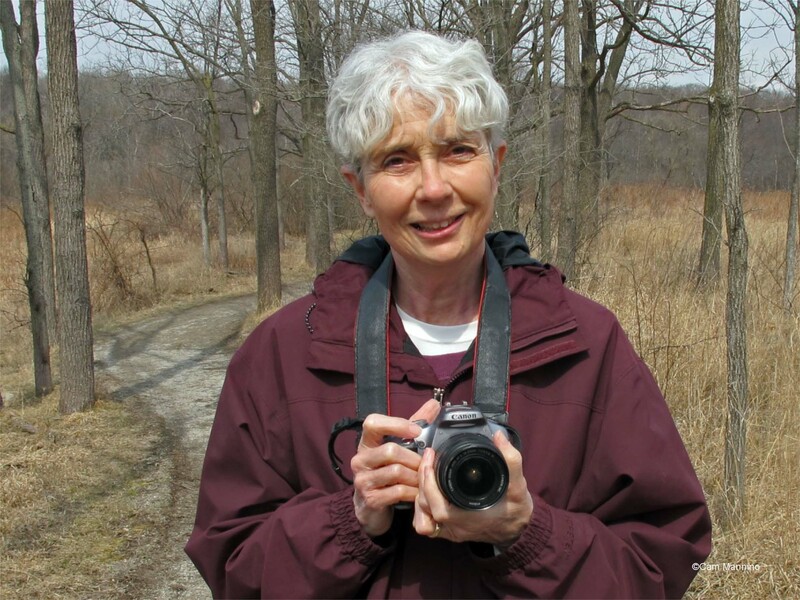 Gray Catbirds meow from the thickets, Black-capped Chickadees scold on nearby branches – and birdsong flows down from the treetops, trilled by cardinals and other songsters that I don’t yet recognize by ear. 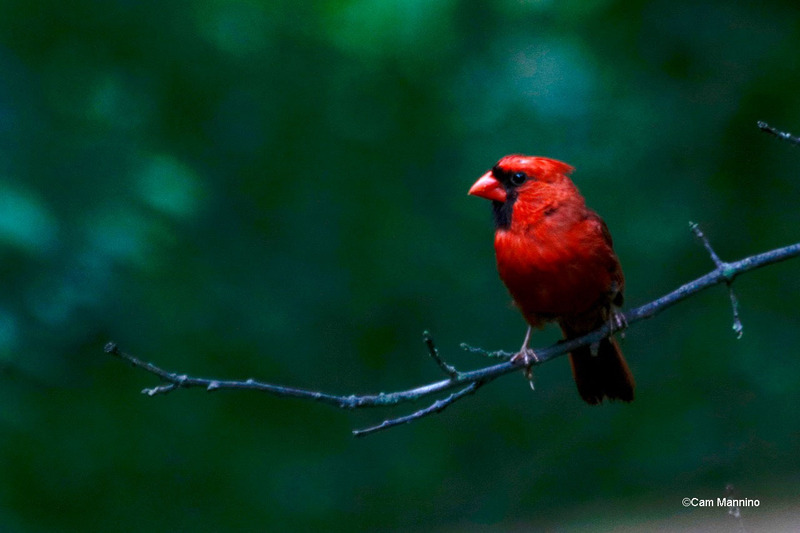 Northern Cardinals (Cardinalis cardinalis) sing from the treetops as you enter Stony Creek Ravine. Black-Capped Chickadees (Poecile atricapillus) search the trees for the insects and spiders that make up most of their diet at this time of year. Occasionally the trail opens to reveal grassy areas filled with wildflowers. Ben and his summer technicians have worked hard to restore some of the open areas that once existed here. Native plants like Bee Balm (Monarda fistulosa) again find a home here as restoration continues in the park. 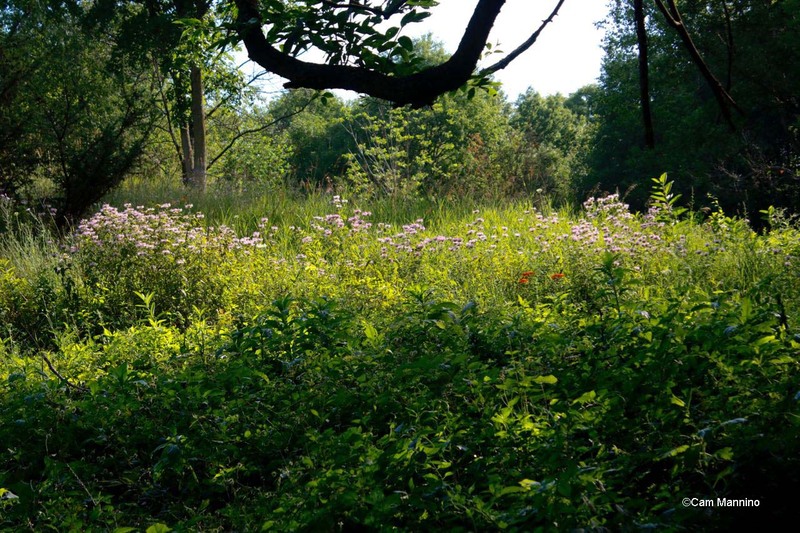 By ridding areas of invasive shrubs, native wildflowers and grasses like these below find a home here once more. Butterfly Milkweed (Asclepias tuberosa) grows taller here than I’ve ever seen it. Native Bottlebrush Grass (Elymus hystrix) is appearing since ecological restoration began here. 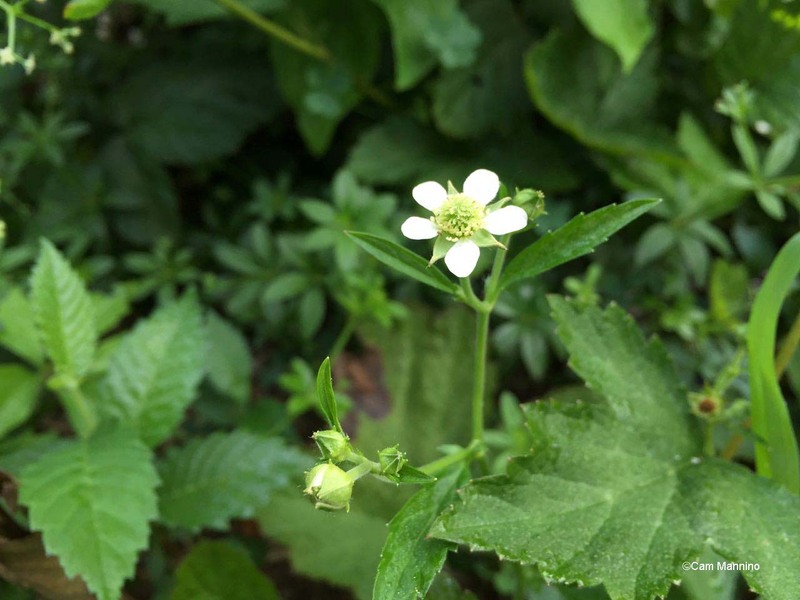 White Avens (Geum canadense), a modest native wildflower, competes for the sunlight in restored areas. In these sunny meadows, a large, native Staghorn Sumac (Rhus typhina) basks in the sunlight without competition from the invasive shrubs that Ben removed last year. 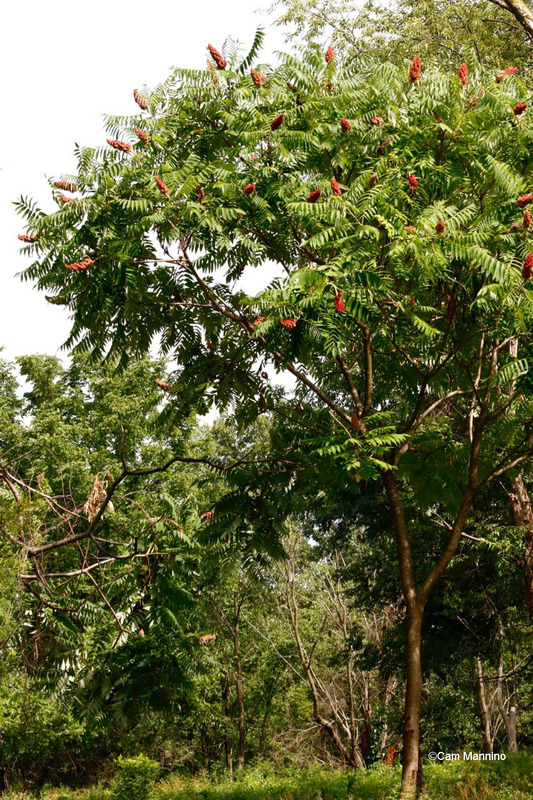 Native Staghorn Sumac thrives in the sunshine, no longer competing with as many invasive shrubs. Mushrooms grow on the moist, steep sides of the ravine. This one appears to be a mushroom from the genus Amanita, mushrooms toxic to humans. Squirrels, though, eat them with no ill effect.I think a nip’s been taken out of this one, actually. 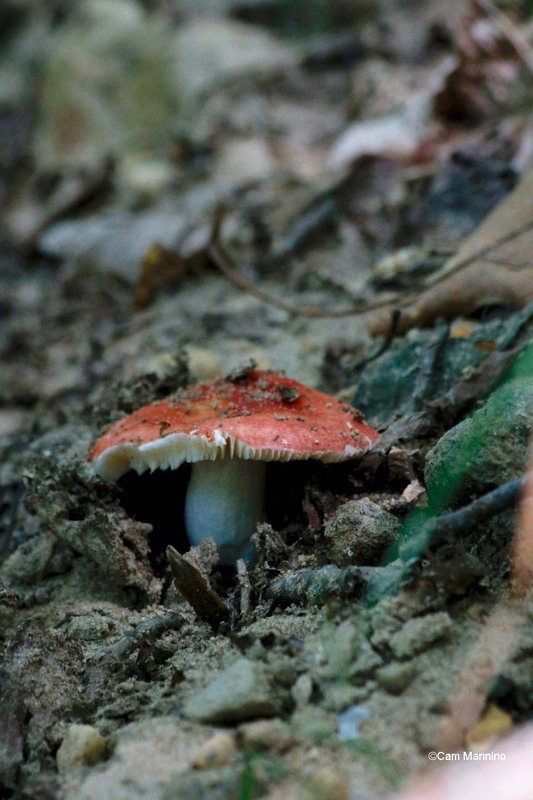 Toxic Amanita mushrooms are perfectly edible for squirrels. Of course, all the flowers attract the bees and butterflies who share your walk. 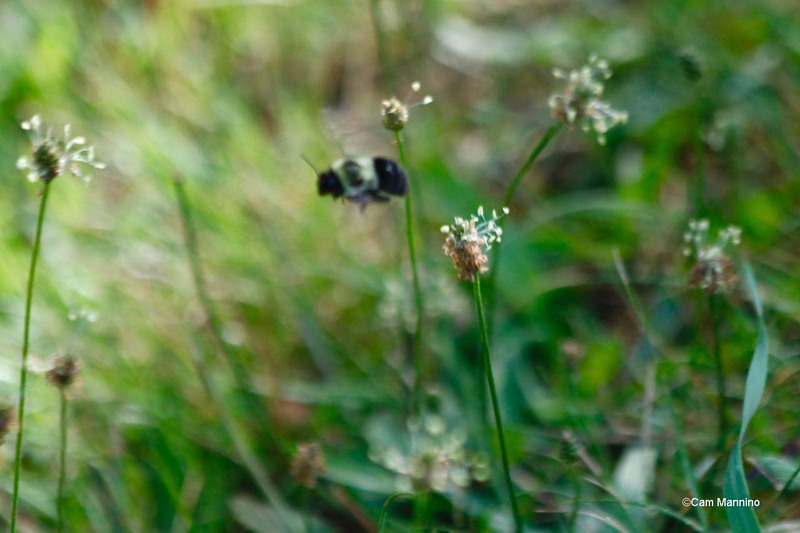 For a few minutes, a Bumblebee (genus Bombus) seemed to be enjoying riding down thin stalks of Narrow-Leaved Plantain (Plantago lanceolata) in the middle of the trail. This small bee seemed to be working awfully hard for the limited nectar or pollen on these plants. Maybe it was just a youngster having a good time or practicing its technique? A small Bumblebee flies from one Narrow-leaved Plantain stalk to the next. The bumblebee repeatedly rode the stalks to the ground, busily trying to gather nectar and seemingly enjoying the ride. Where there’s water, of course, there are damselflies. Ebony Jewelwings (Calopteryx maculata) balance on the leaves at Stony Creek Ravine and can be seen in groups down near the water. A male Ebony Jewelwing damselfly pauses on a leaf in bright sunlight. 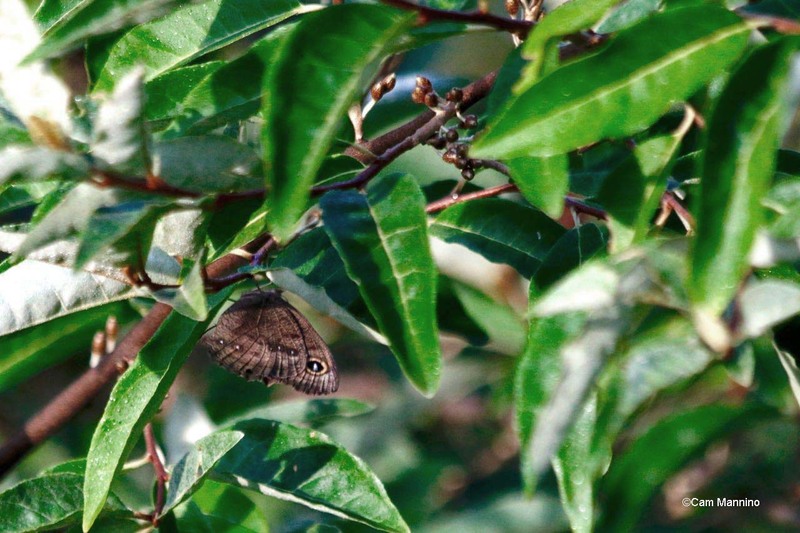 The shy Little Wood Satyr butterfly (Megisto cymela) doesn’t search for nectar or pollen. It bustles about in low foliage looking for plant sap or the sticky honeydew left by aphids. A Little Wood Satyr looking for plant sap – and maybe an escape from the hot sun too. 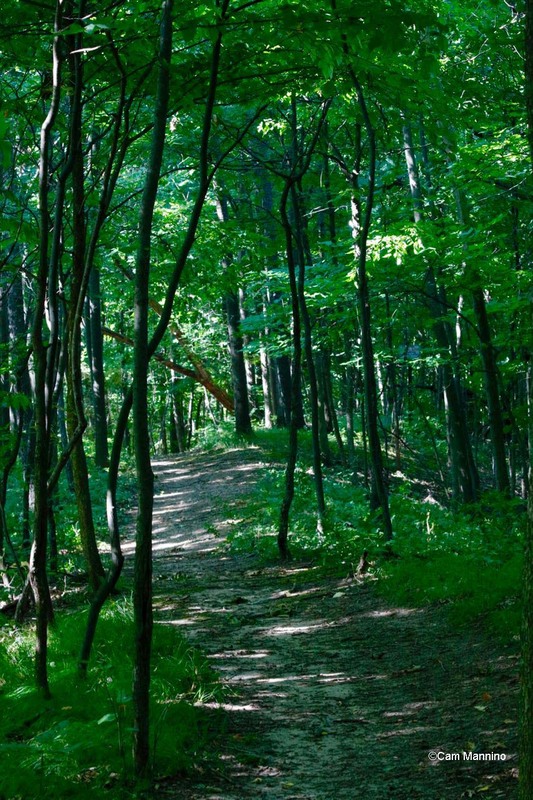 The trail winds gently on into the cool shade of an oak forest. Cool, shady path through the oak forest at Stony Creek Ravine. Along the trail, you’ll see the remains of a farmer’s old stone wall, evidence that this land was once more open and sunny than it is today. 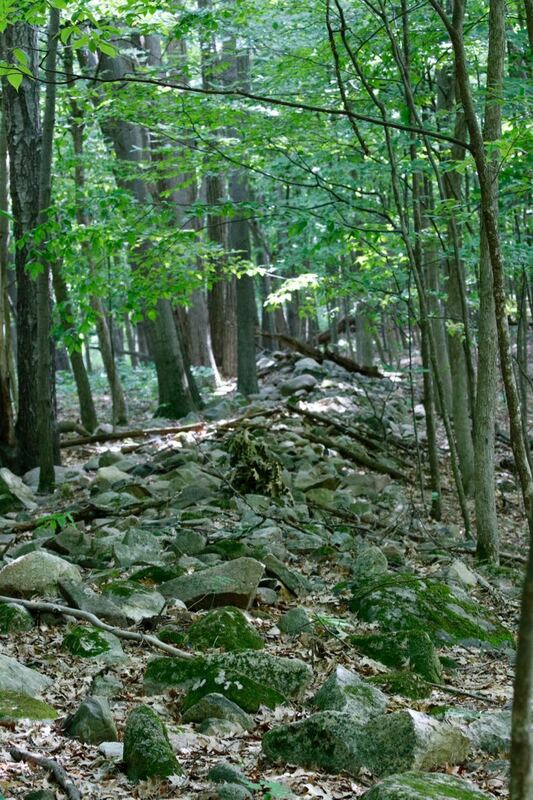 A farmer’s stone wall now lays within the oak forest. 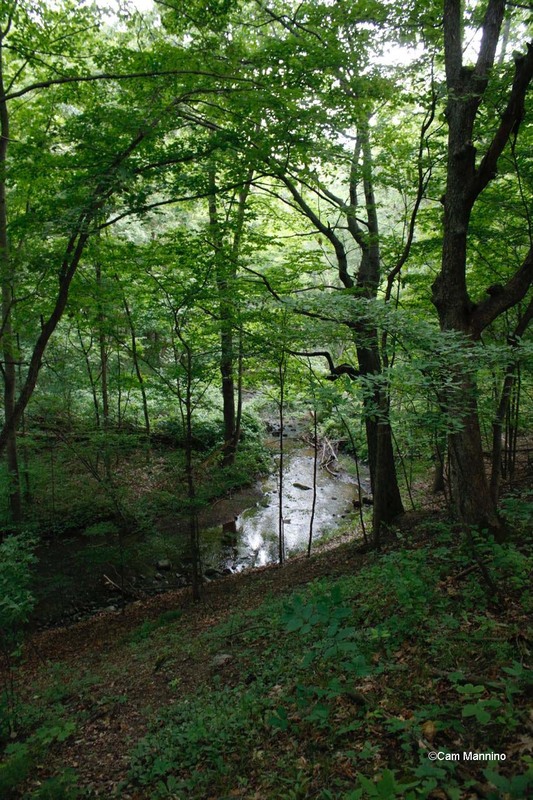 The land begins to fall away on either side of the path, plunging dramatically down to Stony Creek as it winds its way through the narrow ravine below. What a view! And the grade is much steeper than a photo can even make it look! Stony Creek winds its way through the ravine from which the park got its name. It’s important to stay on the trail here since the stream bed is a conservation area and downhill sliding and slipping causes erosion and damage. Here are some of our native plants that find a home at the bottom of the ravine, right near the water. (Hover cursor for captions; click on photo to enlarge). Water Hemlock (Cicuta maculata) may have been used to execute Socrates! 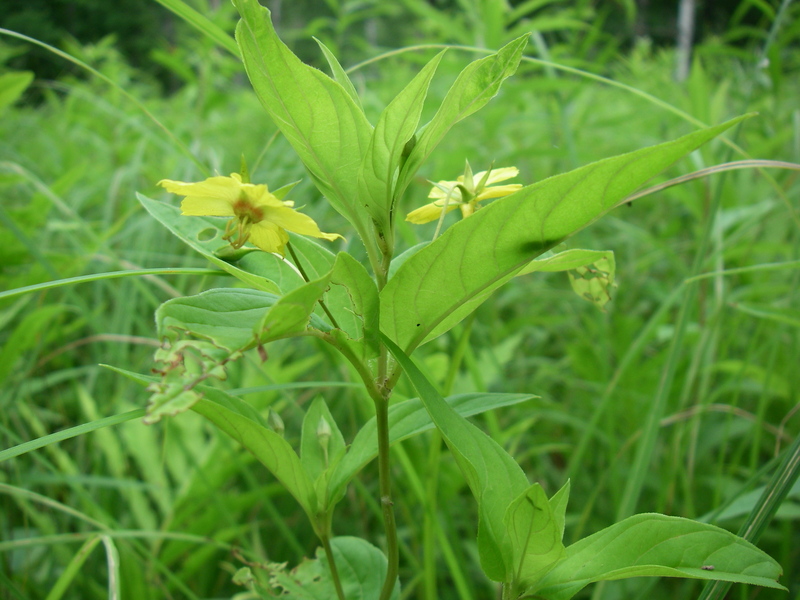 Fringed Loosestrife (Lysimachia ciliata) is a native, unlike Purple Loosestrife. Sensitive Fern vegetative fronds in summer do the work of photosynthesis. White-Tailed Deer (Odocoileus virginianus) are prevalent in this park. 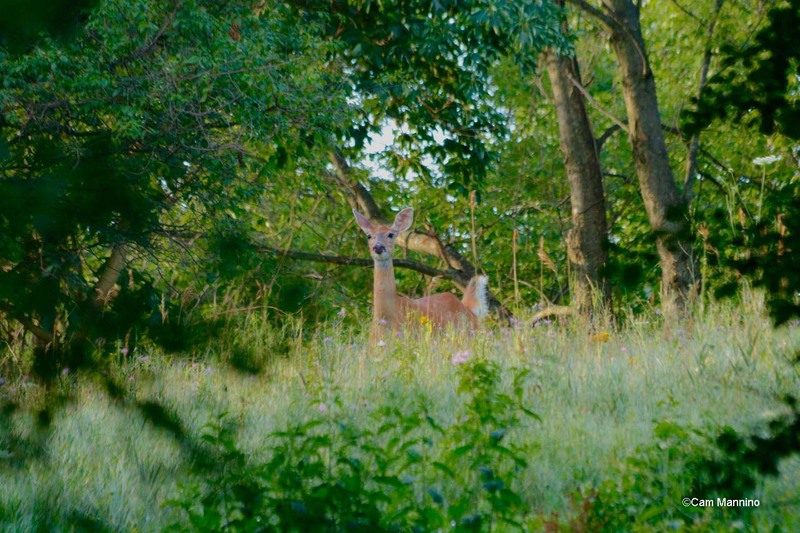 The Parks and Recreation Commission allows controlled hunts in this park every Tuesday and Wednesday from October 1 to January 1, with a PRC-issued special license, to provide opportunity for hunters and to manage the high density of deer in the park. Since the park is closed on those days for 3 months, come visit this slice of dramatic beauty on different days or during the other 9 months of the year . Deer hunting is allowed, with a PRC license, Tuesdays and Wednesdays from Oct.1 to Jan.1. No hiking then! Currently the park’s trailhead is at the end of Knob Creek Drive which is off E. Gunn Road. Right now there is only room for one car to park off-road at the entrance. 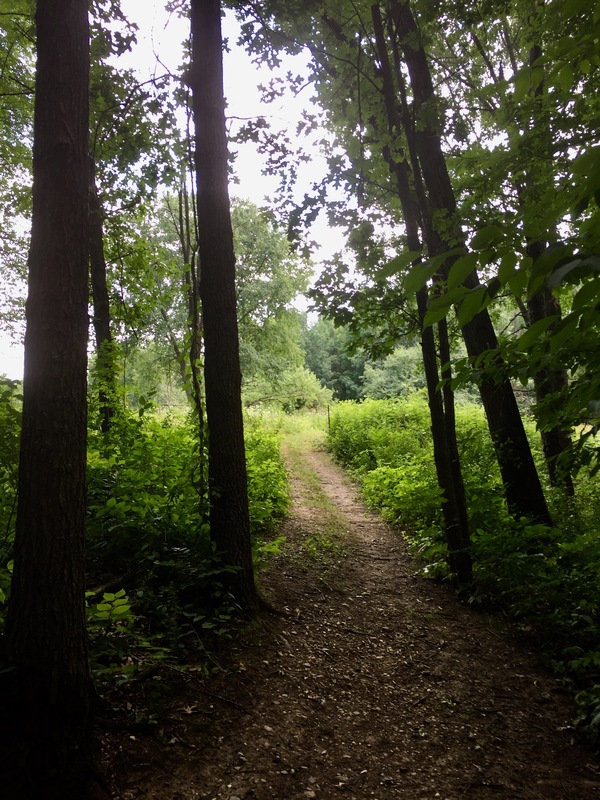 The PRC applied for a grant to help purchase an adjacent 209 acres to expand this park – an area full of wildflowers and the wetlands that birds and amphibians love, plus space for plenty of parking off Snell Road. Fingers crossed that we receive that grant! 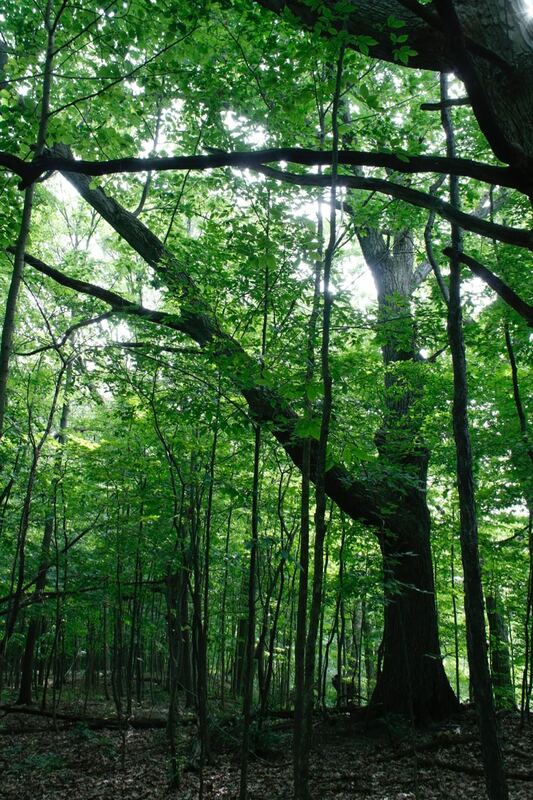 The trail takes you to a great vantage point and then ends within the park’s forest of sturdy oaks and their saplings. When you turn to walk back, you’ll be surprised, I think, by how much you notice that escaped your attention on the way in. I always am. Large Red and White Oaks stand among smaller trees along the top of the ridge at the end of the trail. This week the fierce heat subsided and in its wake, earlier blooms, like the milkweed, dried and began to produce fruit and seed. But late summer wildflowers gloried in the sunshine, lining the paths with dancing color and basking in the dappled sunlight of the woods. Darners patrolled without pause, zooming across their territories while smaller dragonflies hovered and darted in the sunshine. Young Red-Tailed Hawks soared above and juvenile Northern Flickers explored on their own while some adult birds begin to disappear into bushes and reeds to start their late summer molt before migration. This week Eastern Tiger Swallowtail butterflies (Papilio glaucus) and Monarchs (Danaus plexippus) chased across the Old Fields looking for nectar. This is a photo from a few years back when a female of both species met for a sip of nectar on a Bull Thistle (Cirsium vulgare), an invasive plant from Eurasia. Thanks to hard work by the Parks Commission, most of the Bull Thistle is gone from Bear Creek, but the occasional plant crops up from time to time. 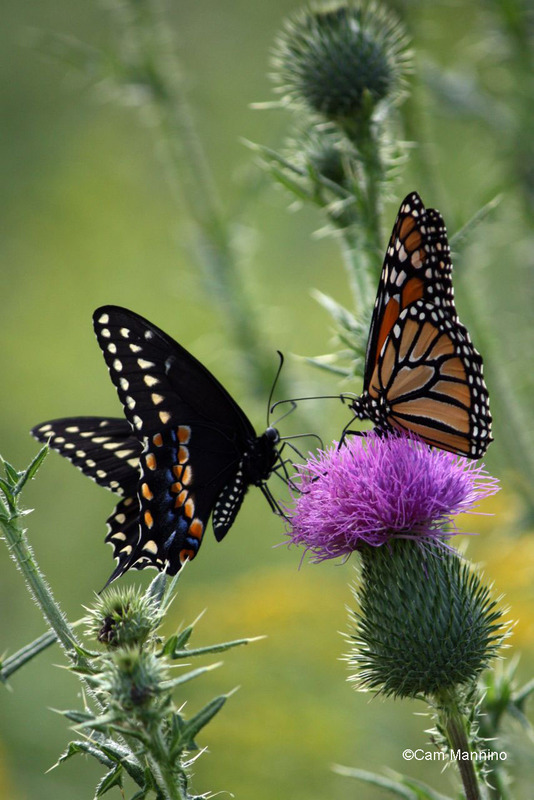 A black morph female Eastern Tiger Swallowtail and a female Monarch meet for a sip of nectar on a Bull Thistle. By the way, if you see a smaller Monarch-like butterfly with a black bar on the bottom of each hindwing, that’s the Viceroy Butterfly (Limenitis archippus). I was taught that its coloring mimics the Monarch because birds find Monarchs distasteful, if not toxic, so the pattern and color offer protection from predators to the more edible Viceroys. But according to Seven Ponds Nature Center in Dryden, Viceroys are just as distasteful as Monarchs to some predators. So it’s apparently just another warning signal to unwary birds that they won’t like the taste, so stay away! Thanks for the information, Seven Ponds! The black bar across the bottom of its hindwing indicates that this is NOT a Monarch butterfly, a species which tastes awful to birds. This is the Viceroy butterfly which mimics the Monarch’s coloring and its awful taste. 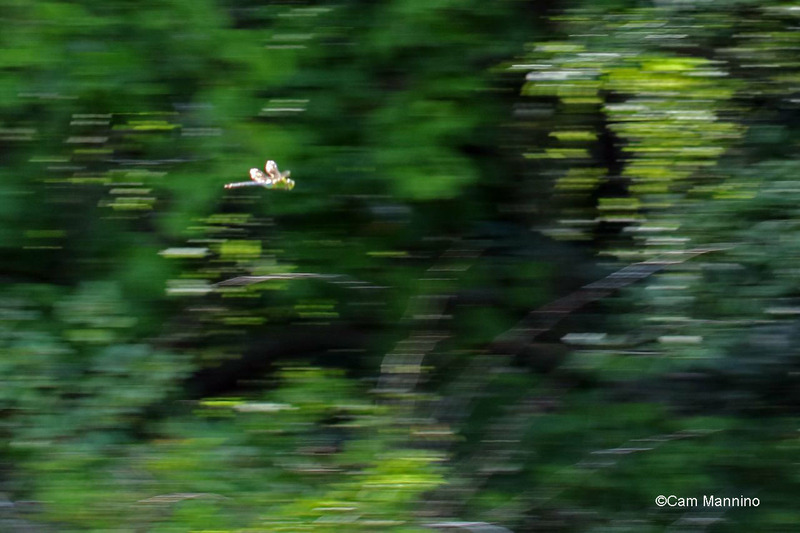 I tried, I really tried, to get a photo of a flying Green Darner (Anax junius), who was patrolling about 100 yards of wildflowers on the western side of the sloping path on the southwest side of the park. I had to try because he never stopped zooming back and forth for a full 20 minutes! I could see his green head and thorax and his blue abdomen but the camera (at my skill level…) only saw this. But maybe it conveys just how fast this little creature was moving! A Green Darner zipping through the air as he patrols a territory of wildflowers near the sloping path on the southwest side of the park. So here’s a link to a up-close-and-personal shot of this colorful predator. 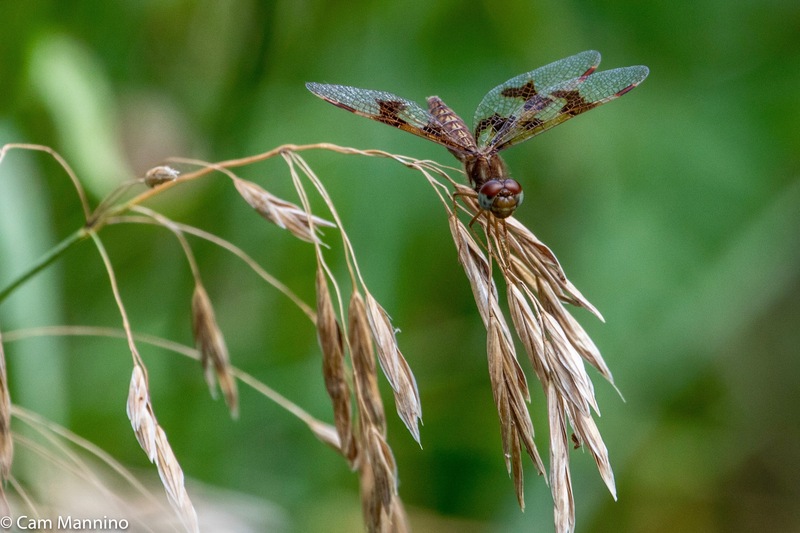 On the edges of paths, among the meadow flowers and at the Playground Pond, a smaller dragonfly poses on a stalk or alights on a railing, the Ruby Meadowhawk (Sympetrum rubicundulum). The four wings of a dragonfly work separately which I imagine explains why the middle of the thorax looks like a complicated set of gears! 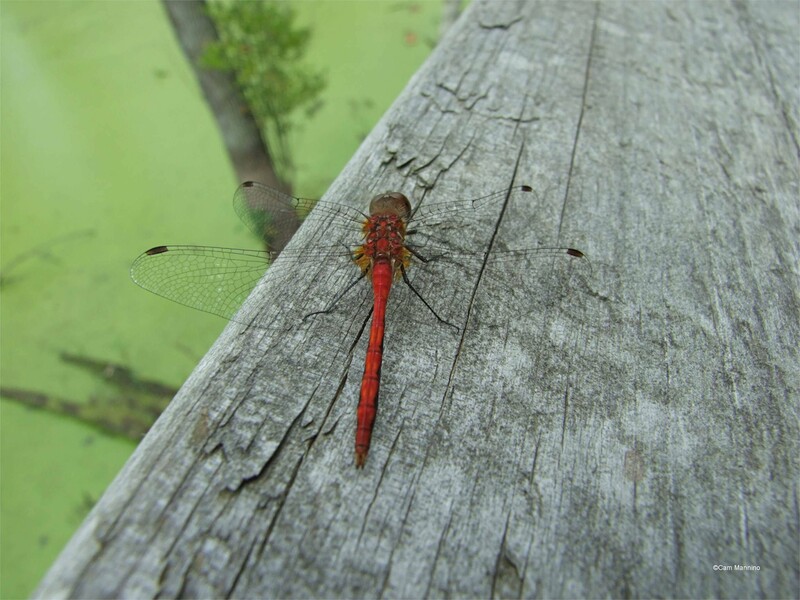 A Ruby Meadowhawk dragonfly on the railing at the Playground Pond. 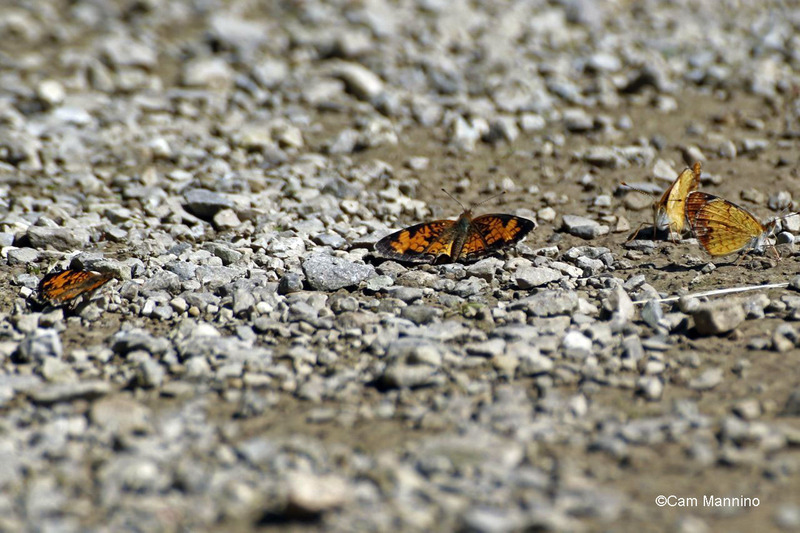 Down near the Center Pond, Pearl Crescent butterflies probed a part of the path that was a bit more moist on a hot day. Pearl Crescents emerge in several broods throughout the summer and newly hatched males can gather in groups like this looking for a drink. A group of newly hatched male Pearl Crescents probe for moisture on a path near the Center Pond. By rights, I shouldn’t like this Red Milkweed Beetle (Tetraopes tetrophthalmus) because I’m very fond of Common Milkweed (Asclepias syriaca). But it’s such a cartoon of a bug that I can’t resist it – and so far I haven’t seen many on the milkweed in Bear Creek. Its red and black color is a warning signal to predators that its distasteful, since, like Monarchs and their caterpillars, it feeds on milkweed. So it can afford to be bright and colorful! 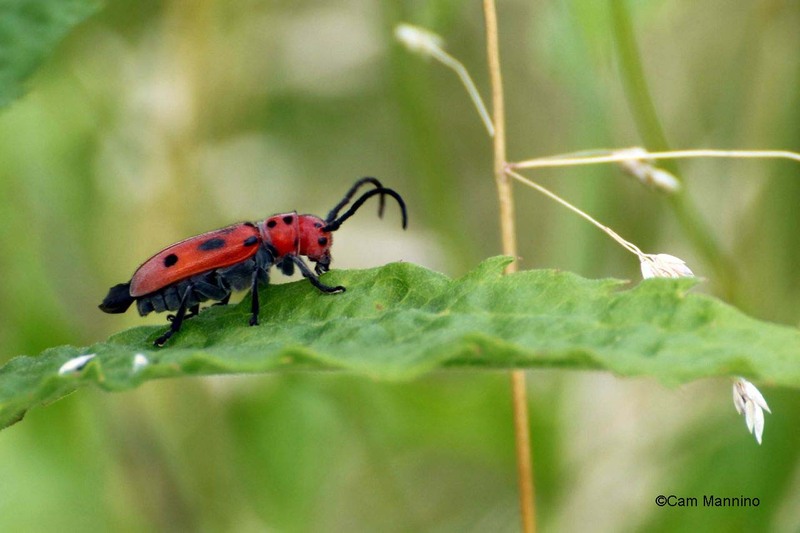 This Red Milkweed Beetle doesn’t worry about being conspicuous. 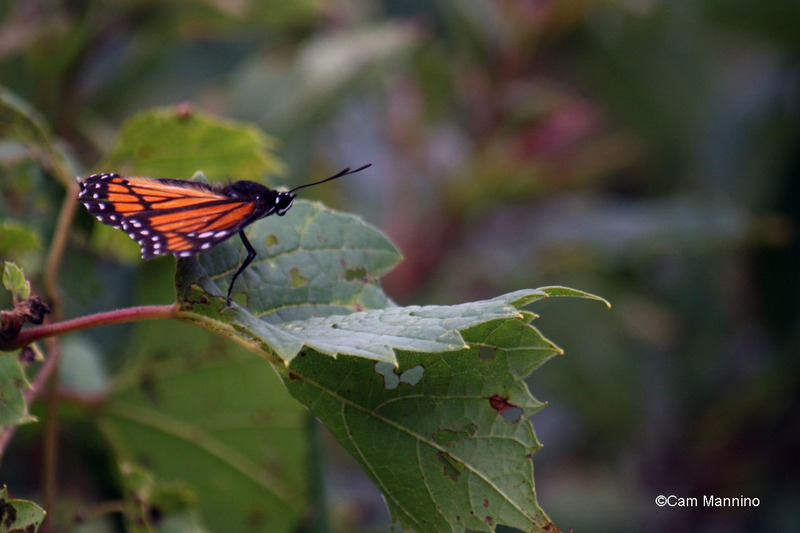 Its color warns predators that it tastes nasty because it eats Common Milkweed. Wings Above: a Juvenile Red-Tailed Hawk and a Fledgling Flicker. High in the air, you may now hear the plaintive, piercing cry of a juvenile Red-tailed Hawk whose parents are tapering off their feeding schedule. Through September, the fledglings screech to express their desire to be fed or perhaps just mimicking the adult scream so beloved of movie-makers, available for listening at this link. The tails of juveniles are not red like their parents; they’ll get those feathers in their second year. 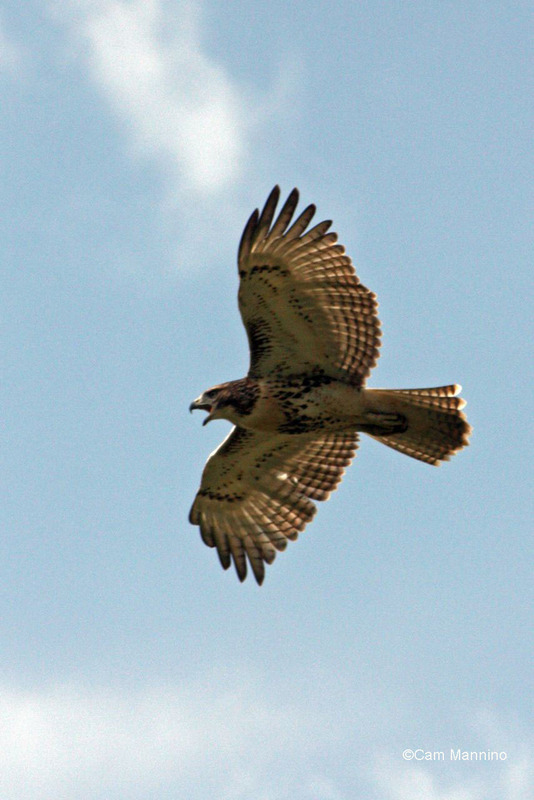 A juvenile Red-tailed Hawk gives its cinematic scream as it flies. It will acquire the characteristic red tail in its second year. Though they drum in trees like other woodpeckers, the Northern Flicker (Colaptes auratus ) spends most of its time probing the ground for ants, its favorite food. You can spot them easily in flight; they have bright white patches on their rumps. 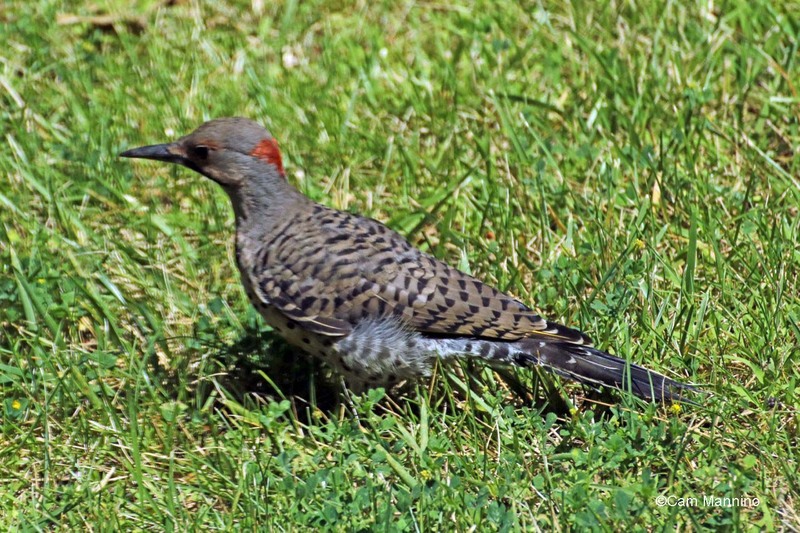 Flickers begin a complete molt sometime during August or September before moving south. While they replace every feather, they are vulnerable and seldom seen. 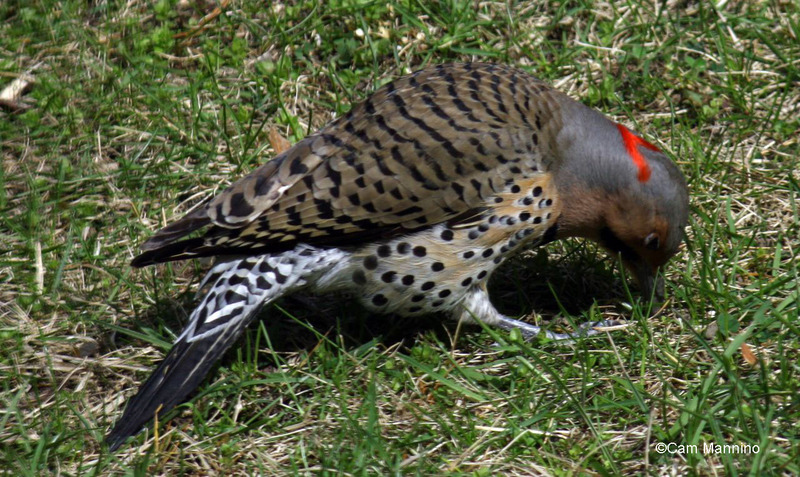 An adult Northern Flicker in a characteristic pose as it probes for its favorite food, ants! This week, though, look for a juvenile. See how much thinner this one is than the adult and the soft tuft of down still on his leg? A juvenile Northern Flicker with a little nestling down above its leg and a much smaller head than the adult flicker. If you’ve been to the park, you know ’tis the season of a favorite non-native wildflower, Queen Anne’s Lace (Daucus carota). Queen Anne’s Lace lines the paths and elegantly swathes the hillside during late July and early August. 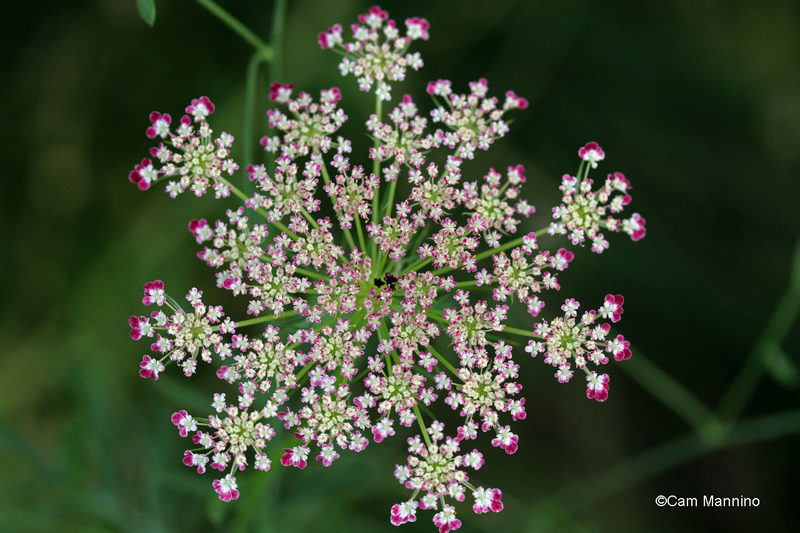 Queen Anne’s Lace is the ancestor of our cultivated carrot. It probably came to the US from Europe as a garden flower and though prolific, it co-exists with our other native wildflowers. Lots of insects visit these plants. Here a blossom hosts both an Eastern Tailed-Blue butterfly (Everes comyntas) and a Pennsylvania Leatherwing Soldier Beetle (Chauliognathus pensylvanicus). 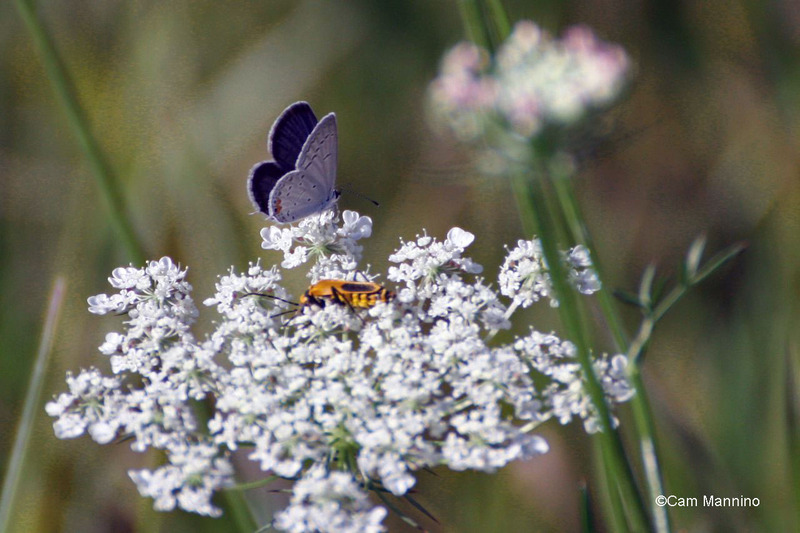 An Eastern Tailed-Blue butterfly and a Pennsylvania Leatherwing Soldier Beetle visit a blossom of Queen Anne’s Lace, a member of the carrot family. This week, along the eastern path, I saw a rare form of Queen Anne’s Lace – one with a pink corolla. I’ve seen pink in Queen Anne’s that are opening, but never one before that was completely pink when open, which the Michigan Flora website says is rare! A pink form of Queen Anne’s Lace, which the Michigan Flora website tells me is rare, was blooming along the eastern path this week. Out in the field next to the eastern path, a native plant I’d never noticed before is blooming. 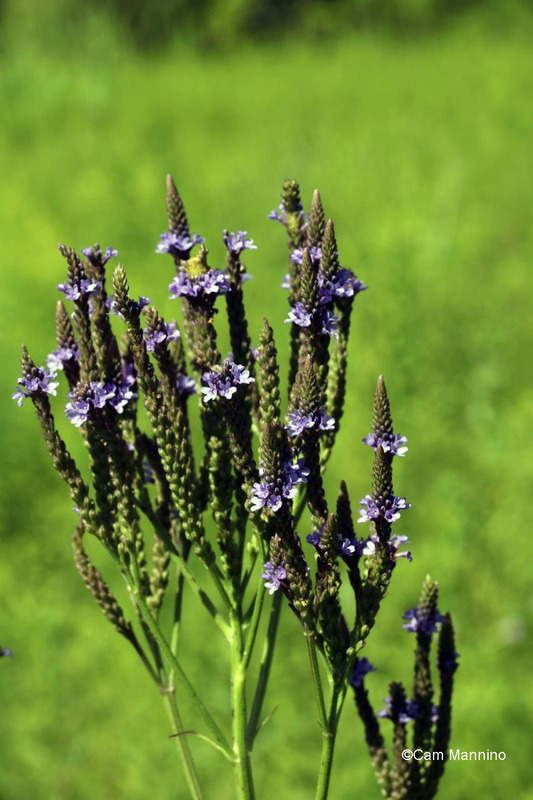 Look for the tall purple stalks of Blue Vervain (Verbena hastata) swaying in the wind. Blue Vervain, a native plant that was new to me, is blooming now near the eastern path. In the woods near the southern deck of the marsh, a modest native woodland flower nods its shy head. 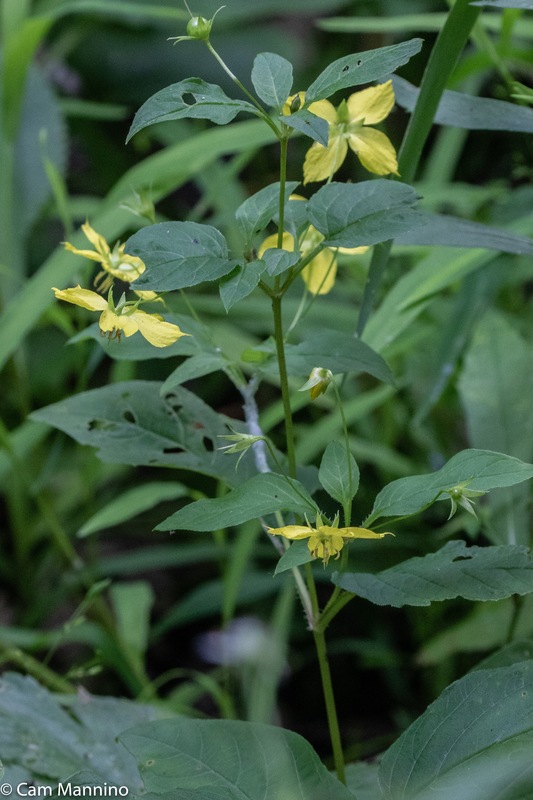 Fringed Loosestrife (Lysimachia ciliata), a native plant (unlike the invasive Purple Loosestrife) presents simply green leaves and two yellow flowers with their heads bowed. The modestly bowed heads of Fringed Loosestrife in the woods near the southern end of the marsh. But when you look underneath to see the blossom’s face, it’s rippled petals and brownish red center are lovely. I’ve never noticed this flower in the woods before. Maybe it’s bloomed because of the prescribed burn in the spring. 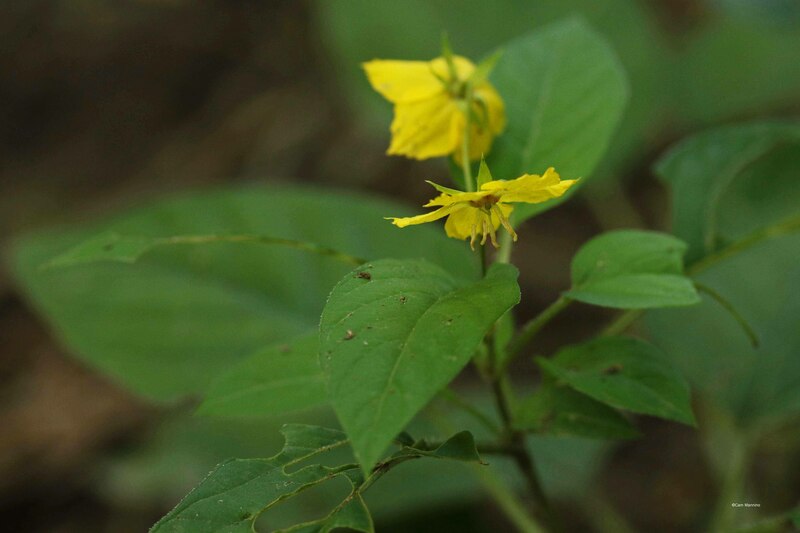 Fringed Loosestrife has nodding blossoms, so you have look closely to see its rippled petals and dark red center. It’s a native woodland flower that may have bloomed because of this year’s prescribed burn. And while you’re at the southern deck in the marsh, have a look at how the heat has brought on the fluffy blooms of native Joe Pye Weed (Eupatorium maculatum) which were only in bud a week ago. 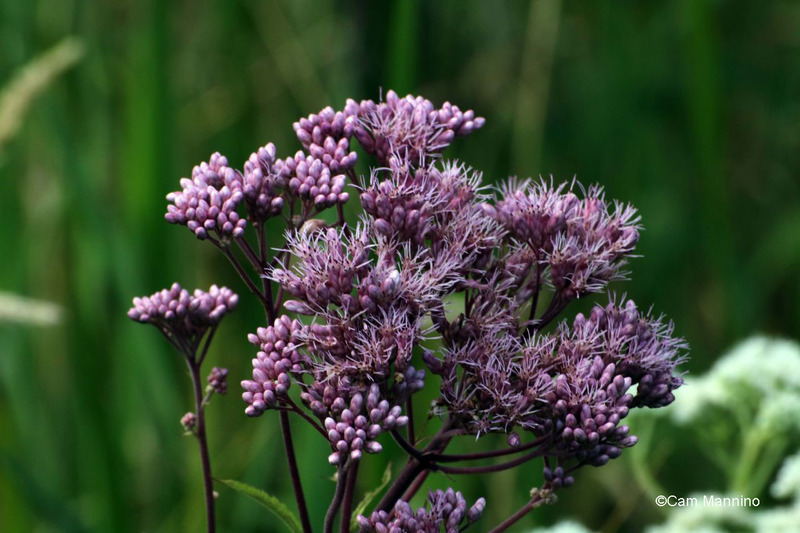 The heat has brought out the blooms of native Joe-Pye Weed in the southern part of the marsh. 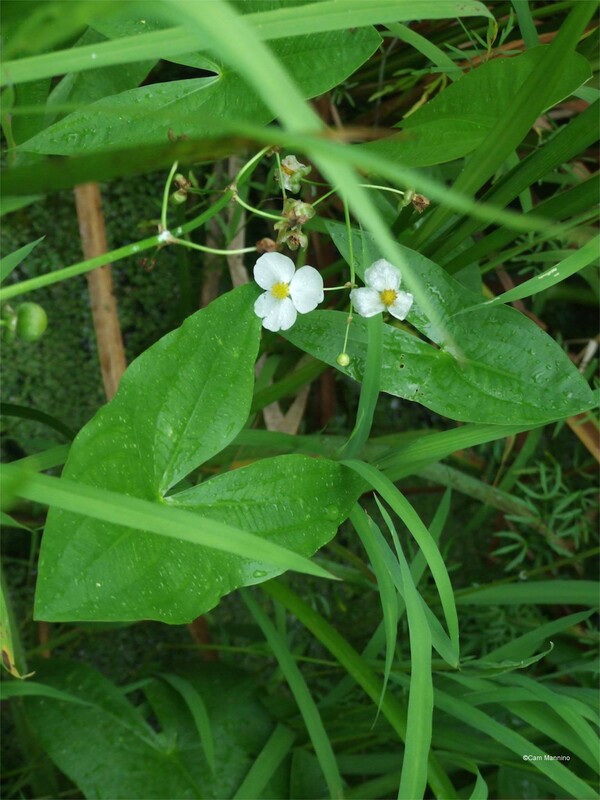 In the northern part of the marsh, a lovely “wet-footed” native is blooming, Common Arrowhead (Sagittaria latifolia). You can easily see where it got its name in a time when arrowheads were part of everyday life! It’s easy to where this “wet-footed” plant in the northern marsh got its name, Common Arrowhead. A view of the Center Pond which is finally clearing again, as it usually does as summer wanes. And this is what you might hear. The 30 second recording (Turn up your Volume!) includes, I think, the singing of an American Goldfinch (Spinus tristis), definitely the trilling a Northern Cardinal (Cardinalis cardinalis) at the very end and the occasional banjo sound of a Green Frog (Rana clamitans). 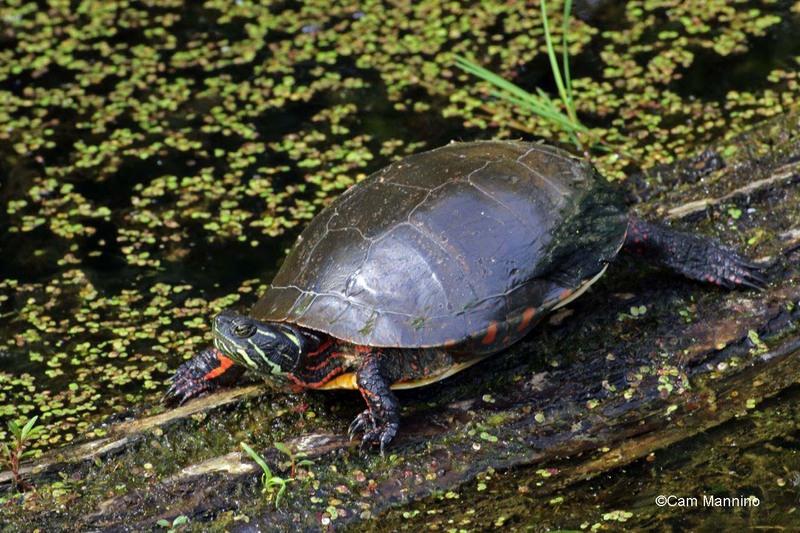 On a nearby log, you’d see a grumpy-looking, but probably content, Painted Turtle (Chrysemys picta), eyes closed and all four legs and neck extended basking in the sun. Such a treat for a reptile that can’t produce its own body heat! A grumpy-looking, but probably happy, Painted Turtle extends all four legs and his neck and head to catch as much of the sun’s heat as this cold-blooded reptile possibly can. Nearby, the incessant scolding of an American Goldfinch could draw you, as it did me, to a nearby tree, where a busy Eastern Gray Squirrel (Ciurus carolinensis) jumped through the branches. The birds must have thought he was looking for their eggs, but Gray Squirrels only do that when nuts and seeds are hard to find – and that’s not the case now in Bear Creek! He was too far up for a good shot but here’s a link to a photo. And if you wandered down the boardwalk on the eastern edge of the pond , you’d see the results of the work that Ben VanderWeide, our stewardship manager, and his summer crew have done clearing away invasives like Common Buckthorn (Rhamnus cathartica), Glossy Buckthorn (Frangula alnus), and Autumn Olive (Elaeagnus umbellata) from that side of the pond. Once the saplings that try to re-sprout are treated, Ben plans to plant some native seeds there. But right now, it’s wonderful to have a clearer view of the pond without all those invasive trees and bushes crowding the shore! Ben and the summer stewardship crew this year and last have cleared away invasive trees and shrubs at the eastern end of the Center Pond. And a lovely natural view emerges! I hope to bring you other “virtual visits” to Bear Creek because I know some of you can’t get to the park as often as I do. But I hope you’ll take the time to spend at least a few hours in Bear Creek while the trees and ponds are still alive with song and wildflowers grace the fields. Slow down and see what a half hour walk can do to make your day a bit more mellow. Treat yourself to a bit of nature. *Quick footnote:  My sources for information, as well as Oakland Township Stewardship Manager Dr. Ben VanderWeide, are as follows: Ritland, D. B., & Brower, L. P. (1991). The viceroy butterfly is not a Batesian mimic; Stokes Nature Guides:  A Guide to Bird Behavior Volumes 1-3, Allaboutbirds.org, the website of the Cornell Ornithology Lab at Cornell University; Wikipedia; http://www.butterfliesandmoths.org; Herbarium of the University of Michigan at michiganflora.net. ; various Michigan Field Guides by Stan Tekiela; Butterflies of Michigan Field Guide by Jaret C. Daniels; University of Wisconsin's Bug Lady at www4.uwm.edu/fieldstation/naturalhistory/bugoftheweek/ for beetle info and invaluable wildflower identification from local expert, Maryann Whitman. Michigan has a lot of water. With so many lakes, rivers, and streams, not to mention the Great Lakes, we are surrounded by water! But we often forget our wetlands, or just dismiss them as wasted ground. 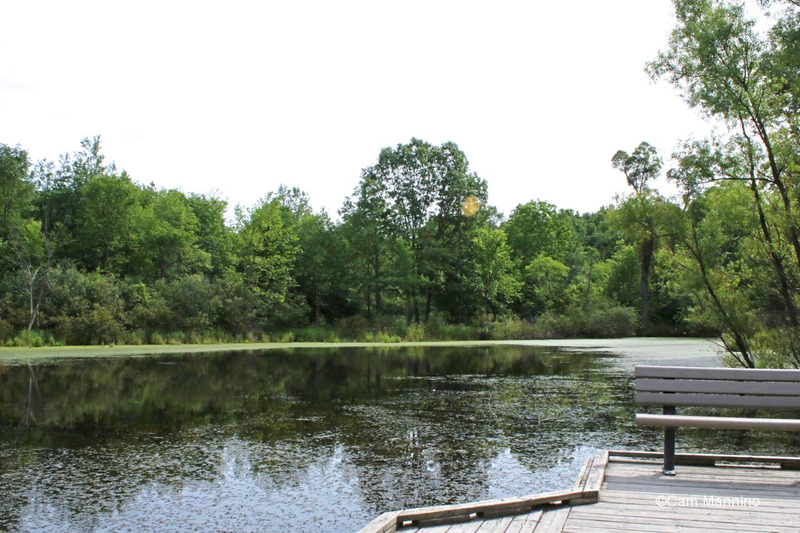 Since Michigan was settled, nearly 75% of our wetlands have been lost. Oakland County isn’t an exception: check out this map to see the drastic changes in the area of wetlands in Oakland County since the 1800s. Our wetlands have been drained for agriculture, filled for development, or “reclaimed” for “better” uses. Wetlands filter water, removing nutrients, sediment, and pollutants. 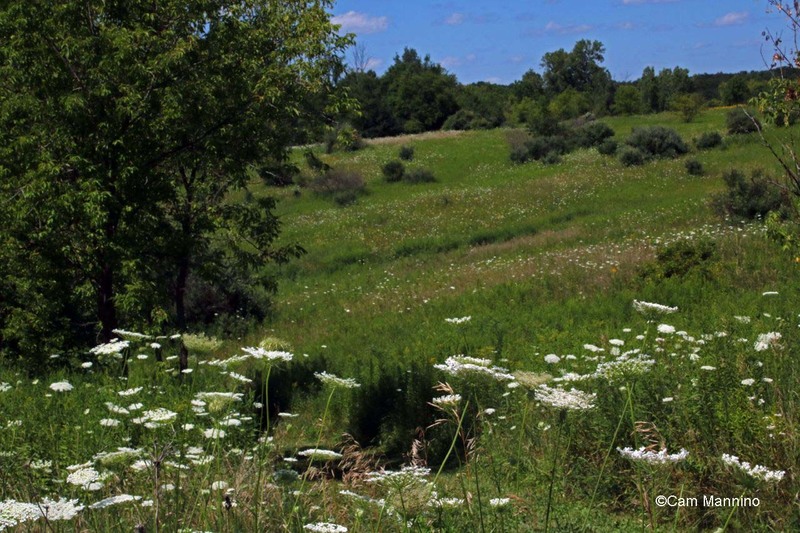 They provide habitat for wildlife and native plant species. When wetlands disappear, water quality declines, and our streams and lakes suffer. There is a reason why only Paint Creek remains as a cold water trout stream in southeast Michigan. Many of the other rivers and streams in this region have lost the wetlands that cleaned their water, exposing them to high levels of sediment, nutrients, and pollutants. When this dirty water arrives in our Great Lakes, it fuels the blooms of algae that create “dead zones” with very low oxygen levels in our lakes. Wetlands also have many special plants with beautiful flowers. Purple meadow-rue (Thalictrum dasycarpum) from the buttercup family has unique white flowers. It can be found in many wet areas. Purple meadow-rue is blooming now in many wetland areas, so keep your eyes open for its unique flowers! 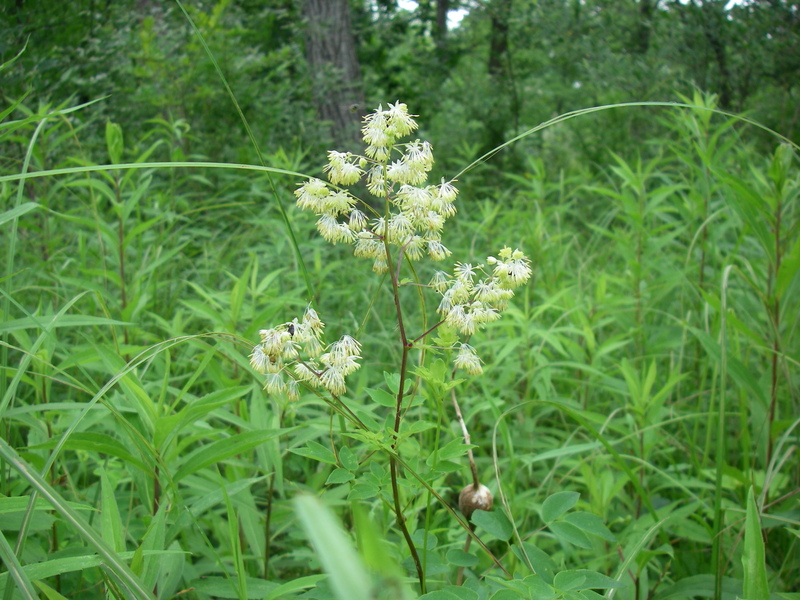 This plant was found at the Paint Creek Heritage Area Wet Prairie on July 2, 2014. Purple loosestrife (Lythrum salicaria) has become infamous as an invasive plant in wetlands, but did you know that we have many native loosestrife species? Our native species are in a different plant family, and have yellow flowers instead of purple. Fringed loosestrife (Lysimachia ciliata) is one of our more common loosestrife species, growing in wet to slightly dry areas. 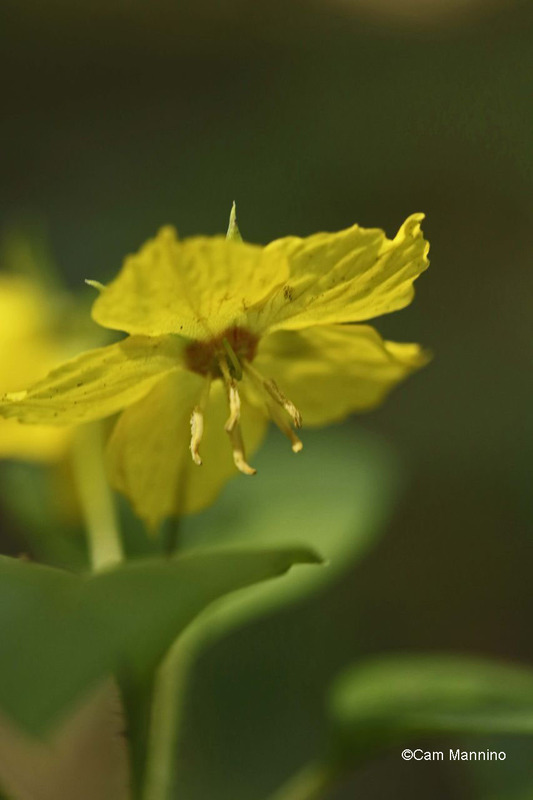 Fringed loosestrife is flowering right now in wet areas, including wet meadows at Paint Creek Heritage Area Wet Prairie. 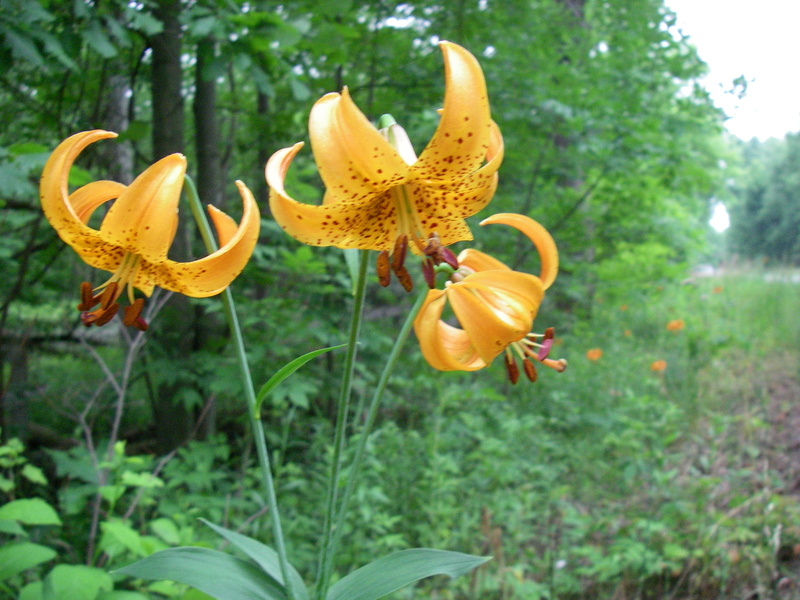 Michigan also has a lily named after it, the Michigan lily! Its Latin name, Lilium michiganense, says the same thing. This native lily can be found from Michigan to Minnesota, and south to Arkansas. We have some growing right here in Oakland Township, but with very high deer densities in our township it is very difficult to find a Michigan lily that hasn’t been browsed. The picture below is from a population I found this past weekend in western Michigan. Michigan lily can be found it wet to moist areas across the upper Midwest. This picture was taken in west Michigan. Once we damage or fill wetlands, we lose many of these unique species. Wetlands that are installed to mitigate filled wetlands never truly replace the wetlands that were destroyed. Mitigated wetlands might perform many of the same wetland functions as the original wetland by removing nutrients and pollutants, but most of the native plants that only grow in intact wetlands will never be found there. We need to protect the wetlands we have! If you find these wildflowers, take lots of pictures, but please don’t pick the flowers or try to transplant them! Leave these beauties for the wildlife that depend on them, and for other people to enjoy.